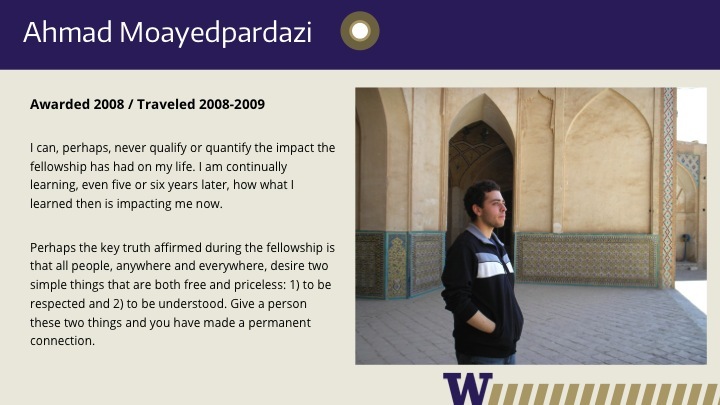 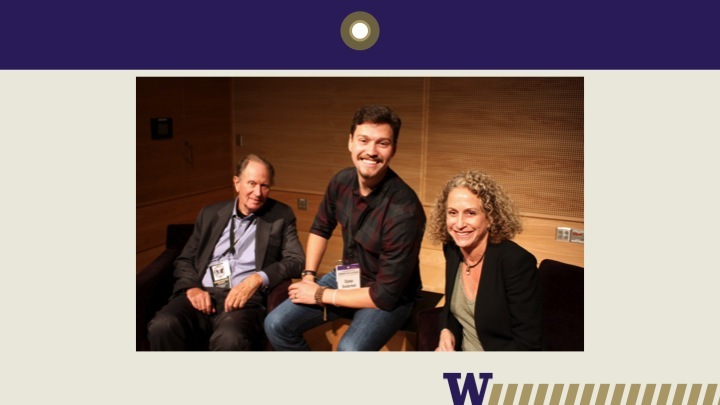 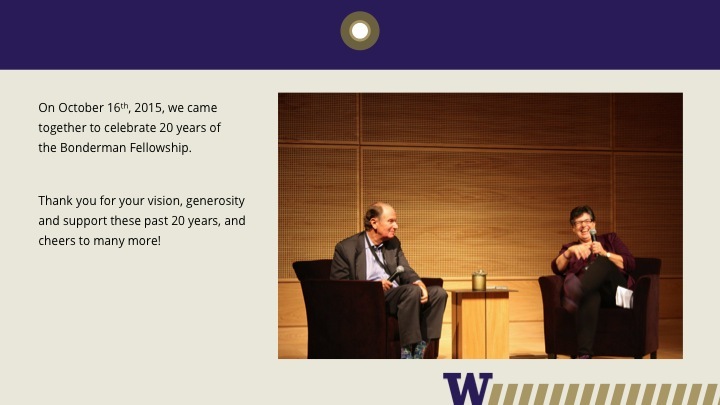 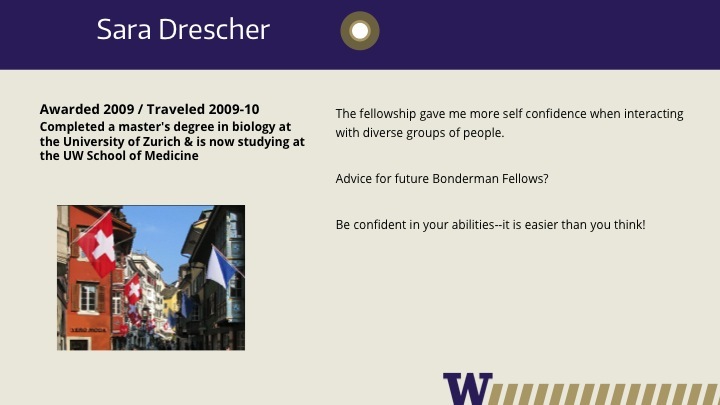 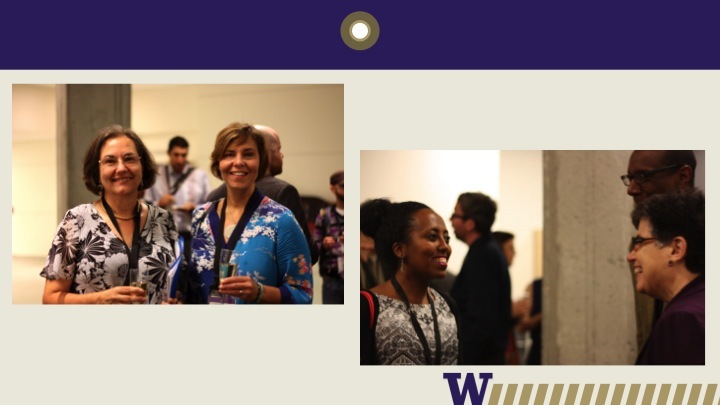 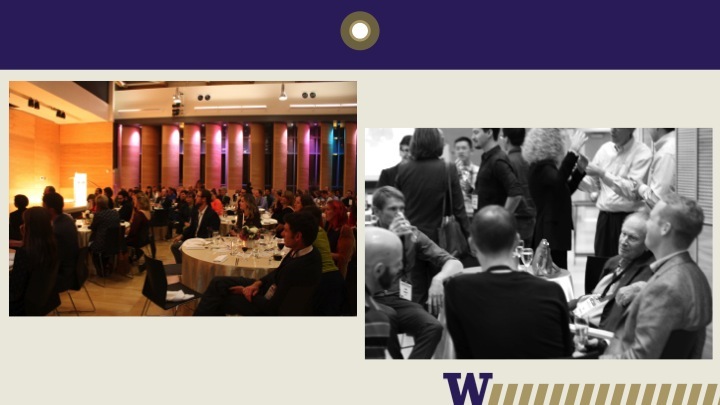 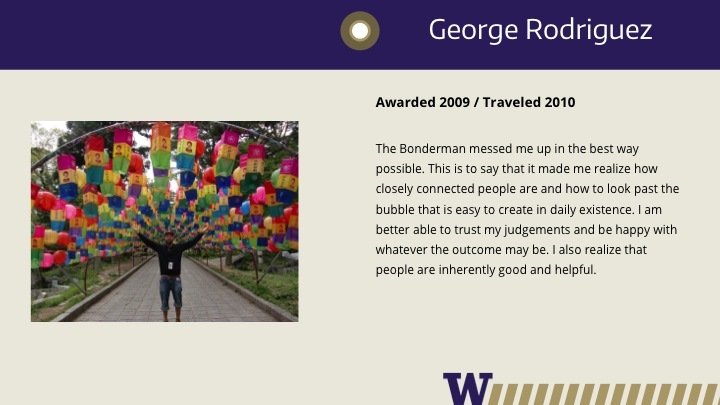 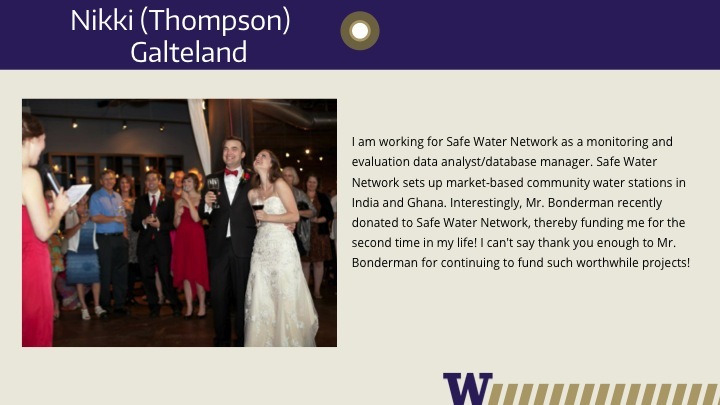 On October 16, 2015 philanthropist, venture capitalist, and University of Washington alumnus David Bonderman celebrated the 20th anniversary of the Bonderman Travel Fellowship with nearly 100 past and current Fellows and their guests. 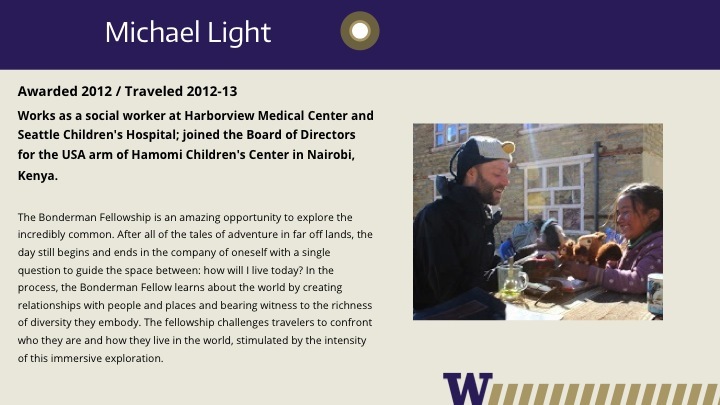 These Fellows, joining us from around the world and representing all disciplines and eras of the Fellowship, came together to celebrate the generosity and vision that has inspired this program for more than two decades. 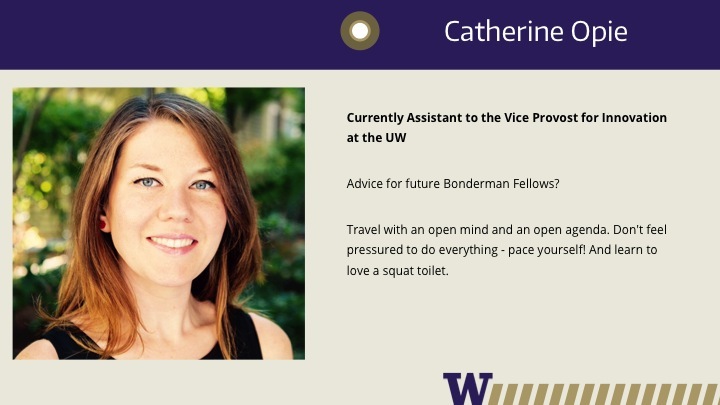 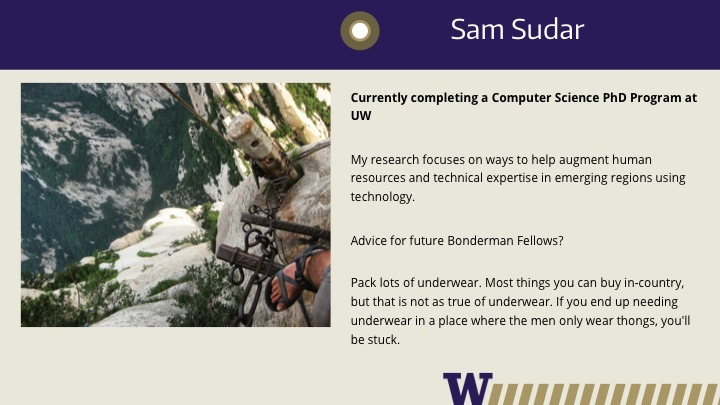 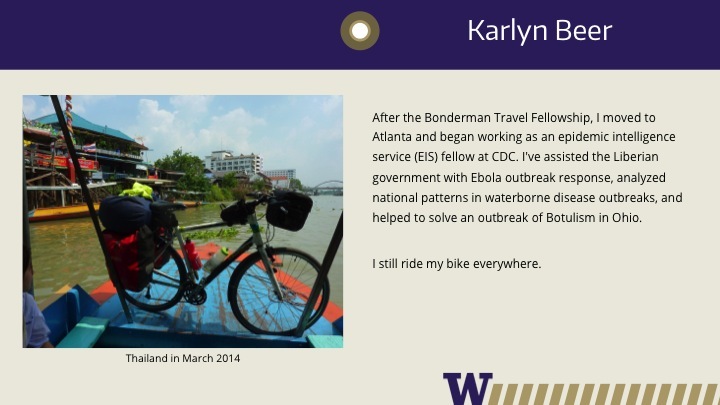 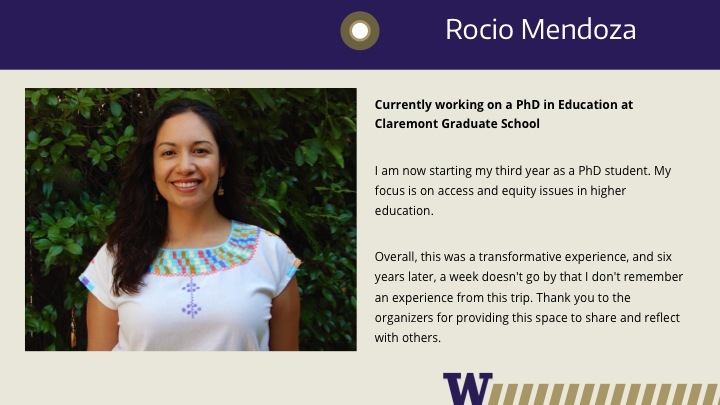 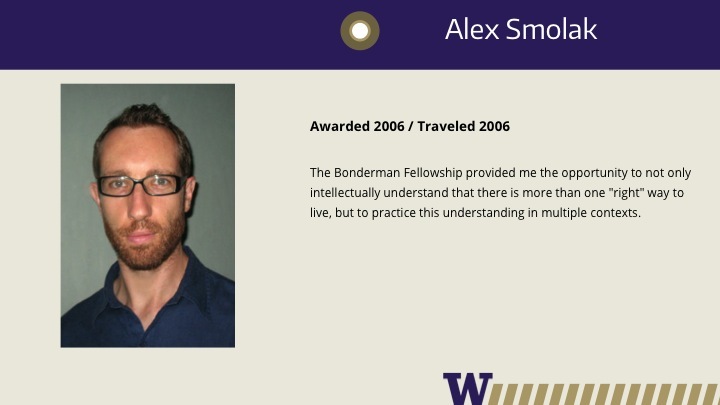 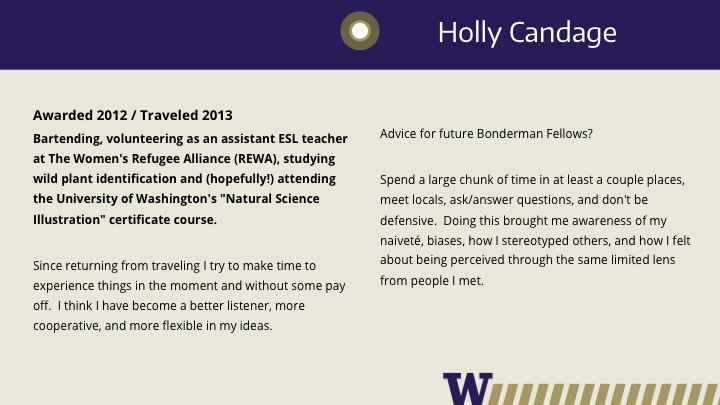 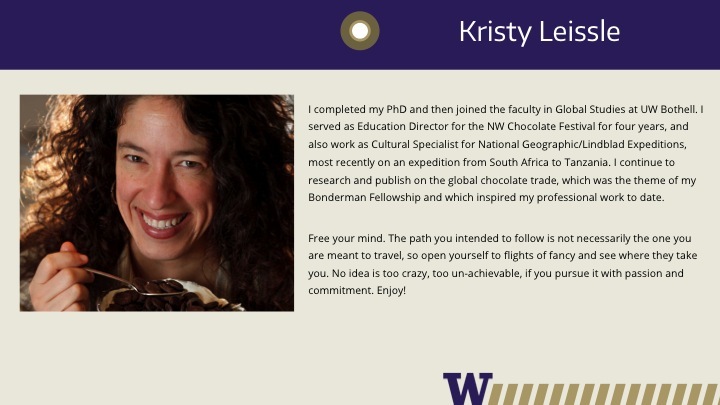 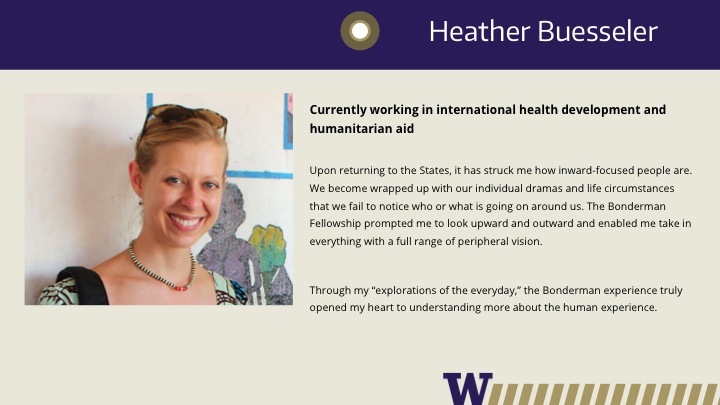 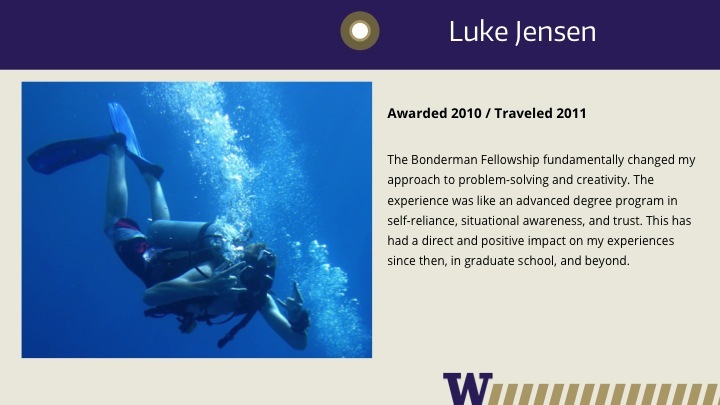 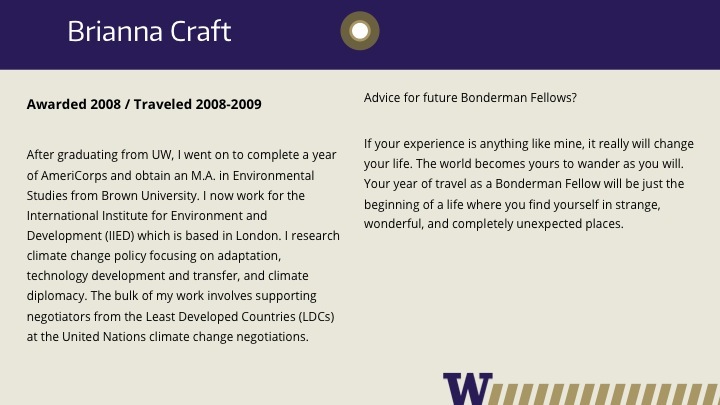 During their “Bonderman,” Fellows travel the world alone without committing to formal research, study or organized tours during their adventure, while experiencing at least six countries in two different regions of the world. 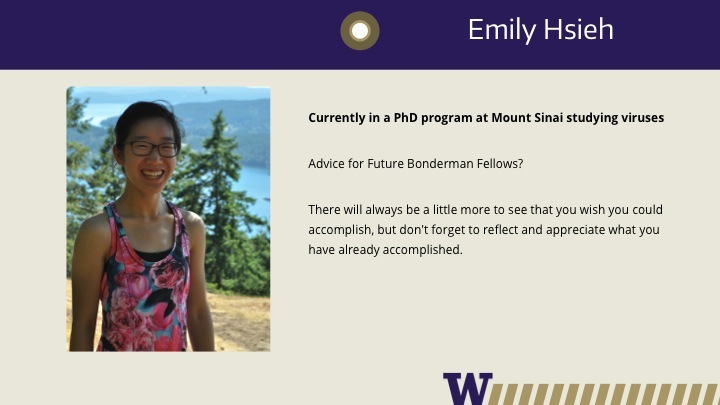 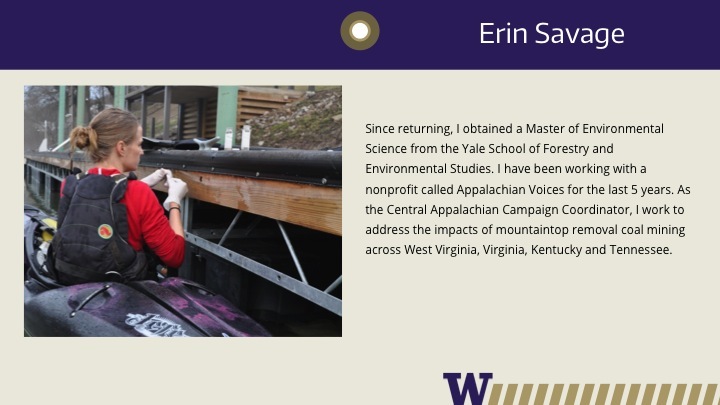 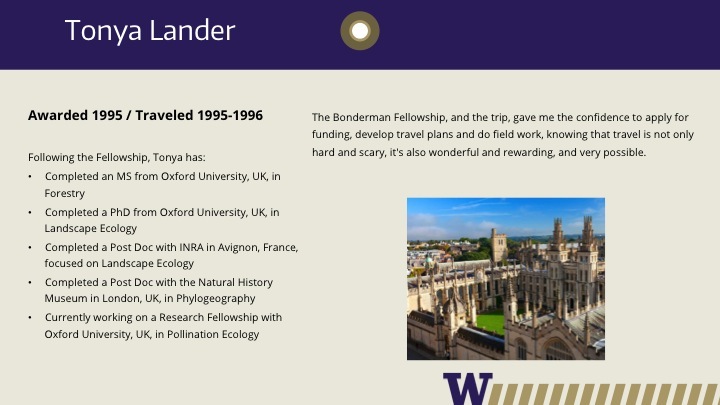 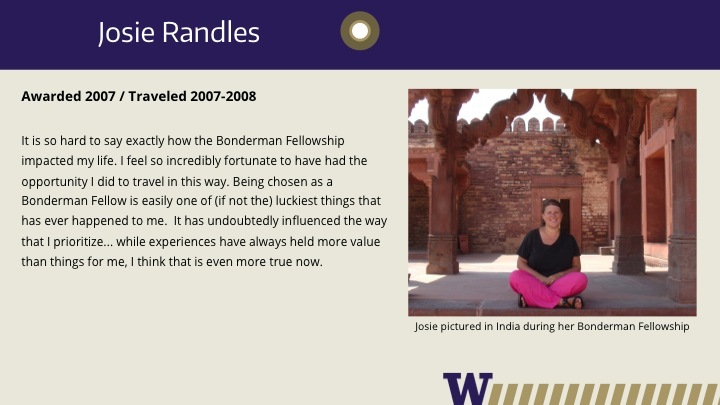 That’s right: Bonderman Fellows are mandated to travel for the sake of travel – to wander and wonder – over the course of eight months, supported by funds, mentoring, and logistical help from the Honors Program and the Graduate School. 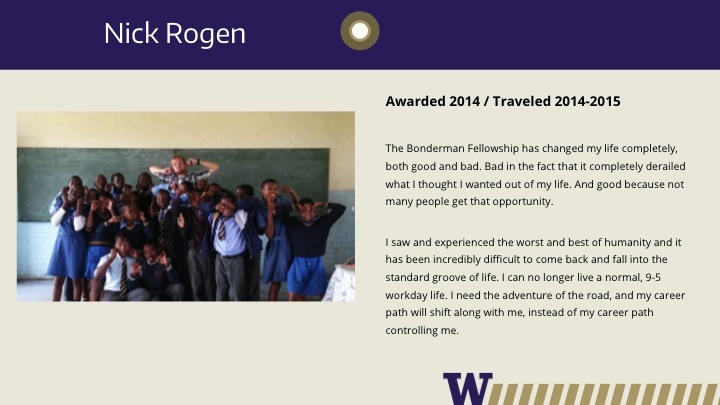 The purpose of this innovative award is to transform lives, and at the recent celebration it was clear that it had done just that. 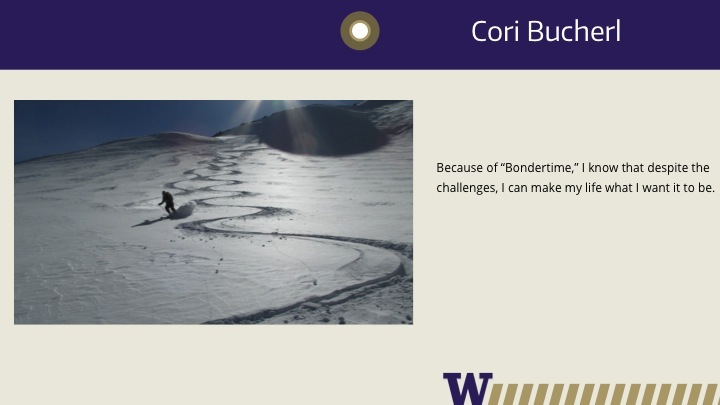 What makes the whole thing possible? 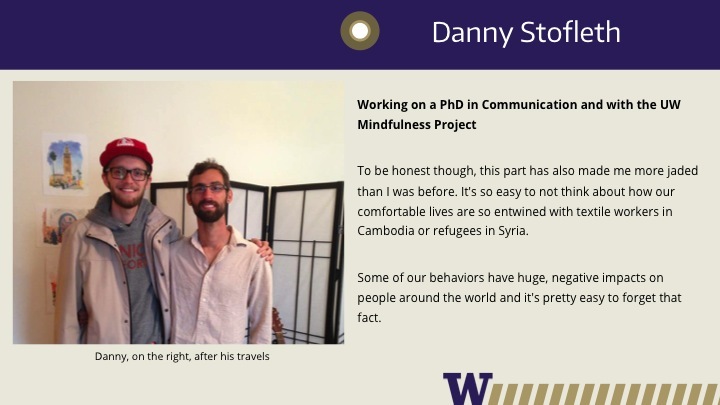 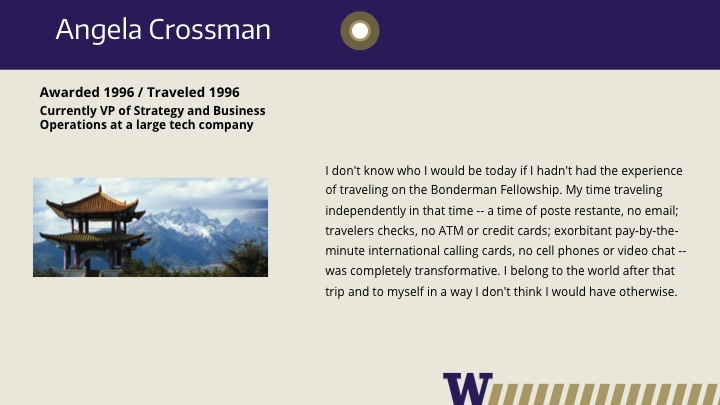 It started with the travels of a young David Bonderman, who found himself wiser for the wear after spending a year wandering the world on a Sheldon Fellowship from Harvard Law in the late 1960s. 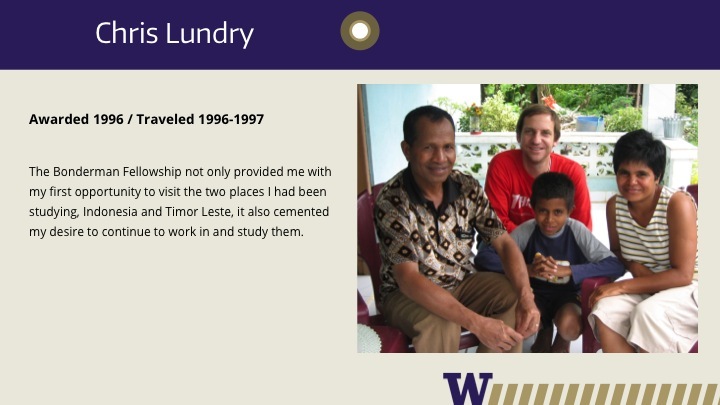 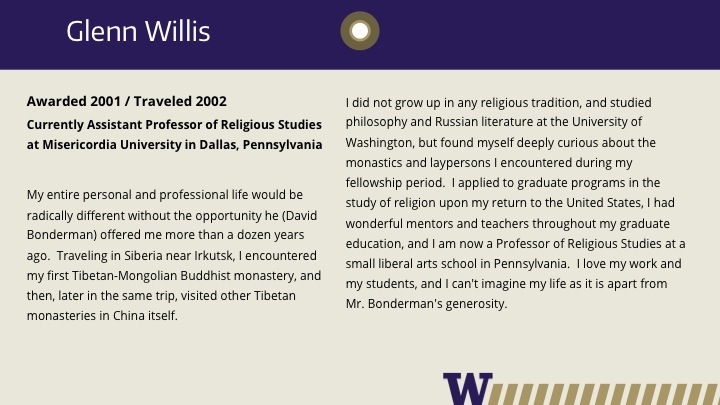 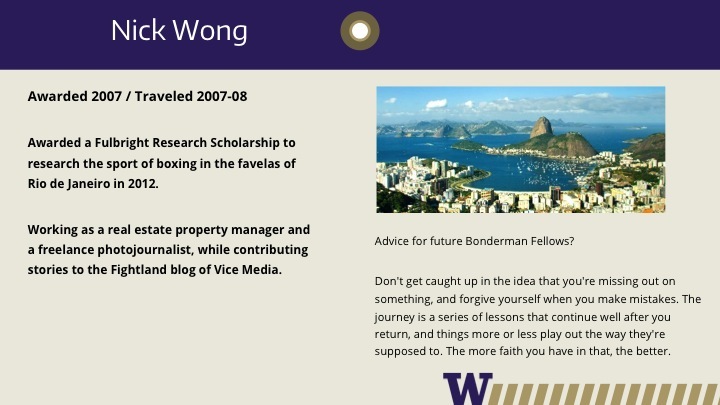 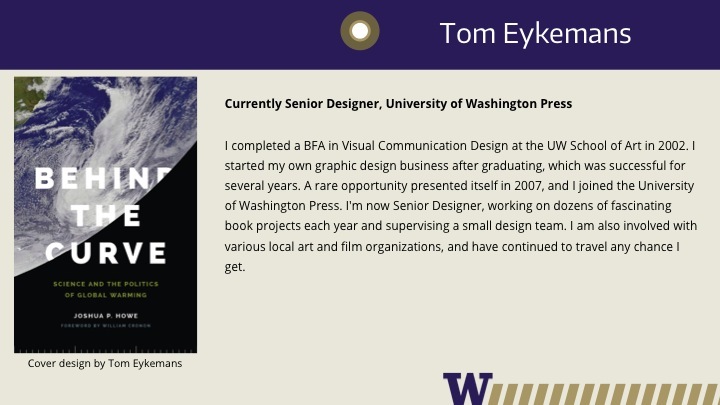 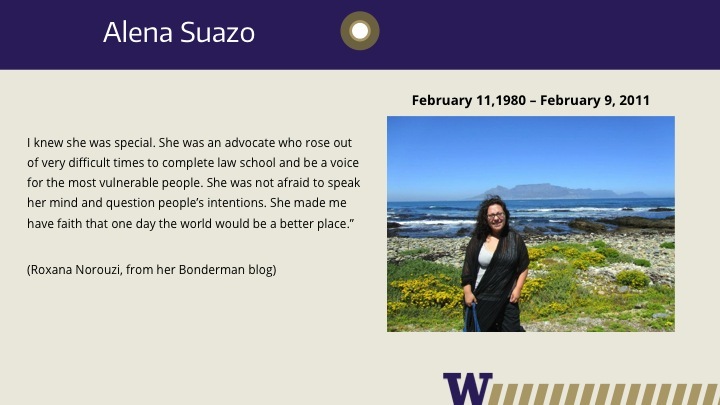 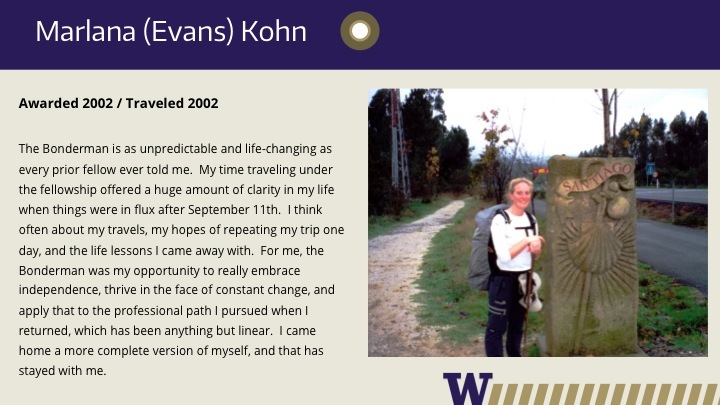 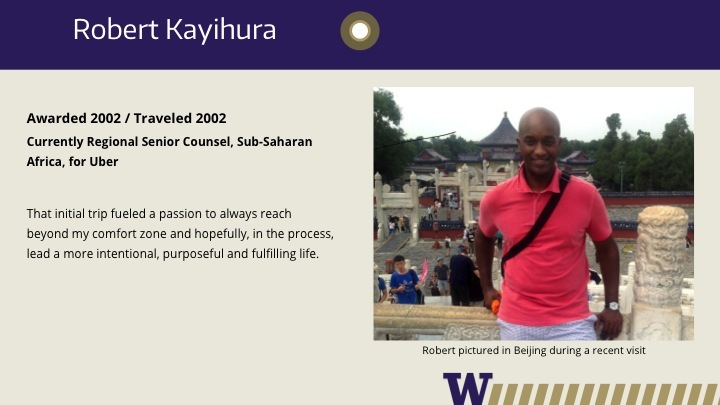 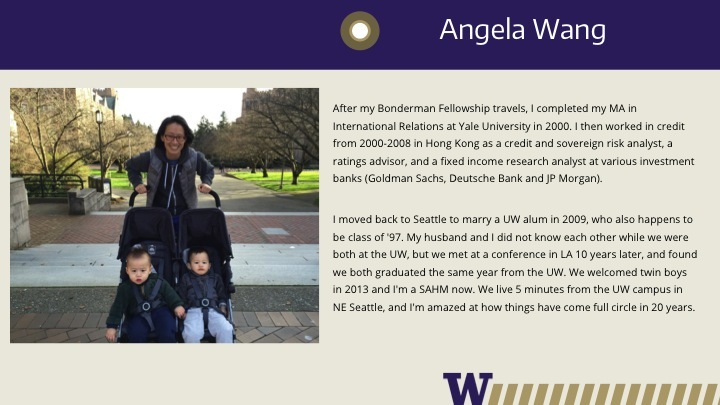 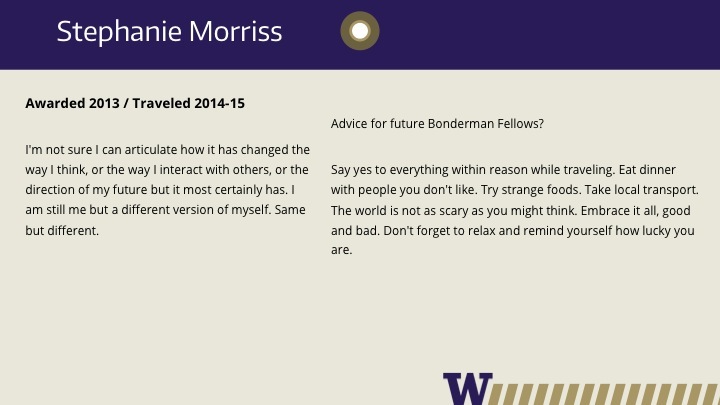 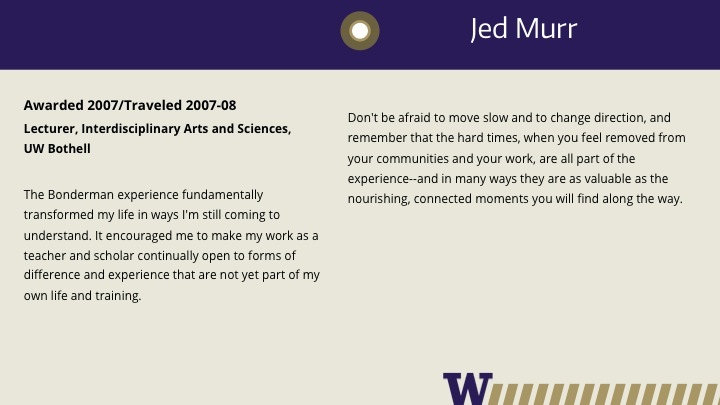 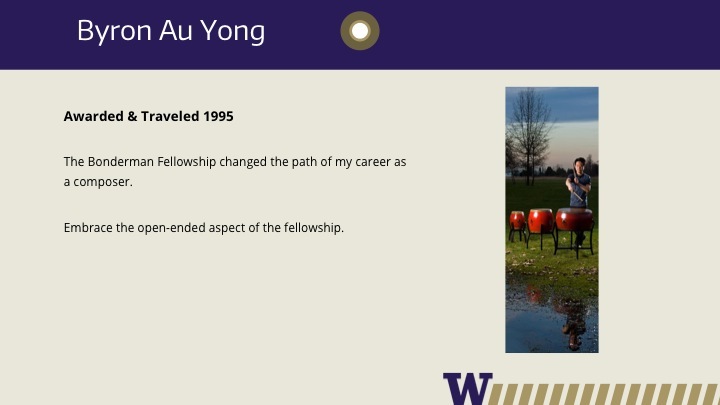 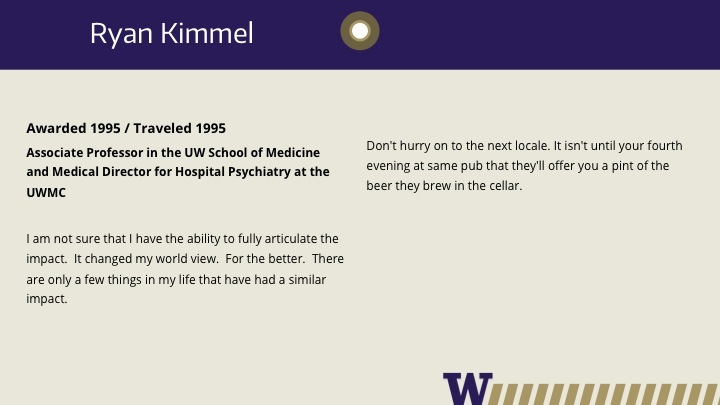 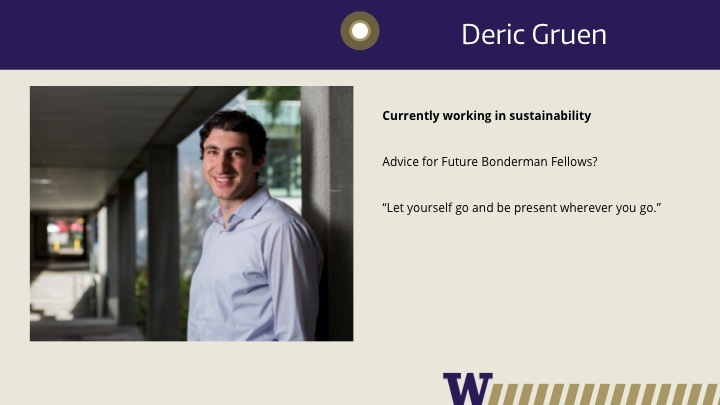 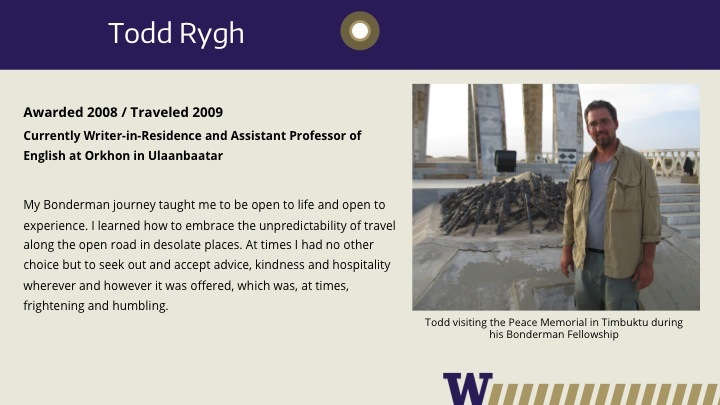 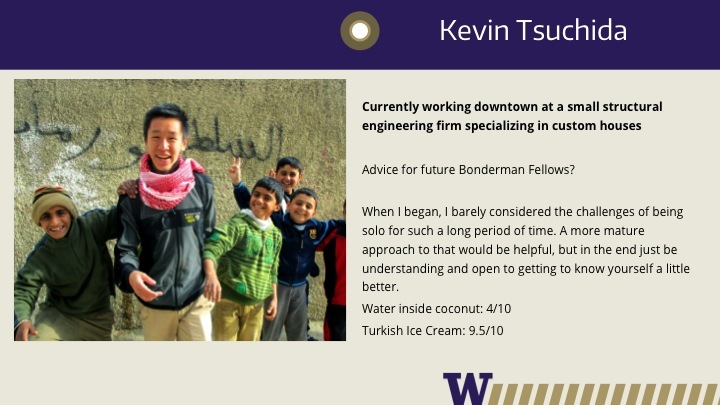 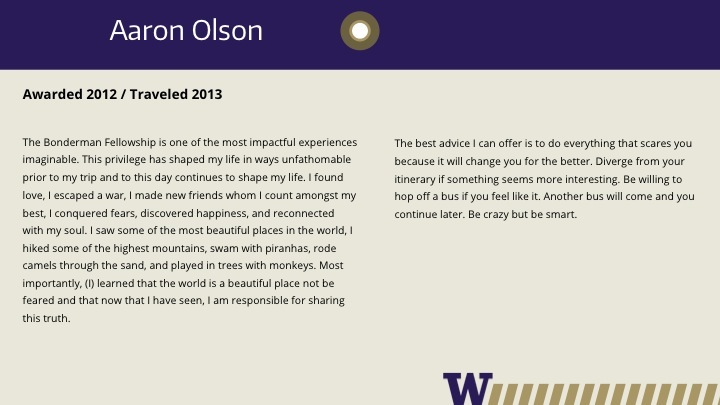 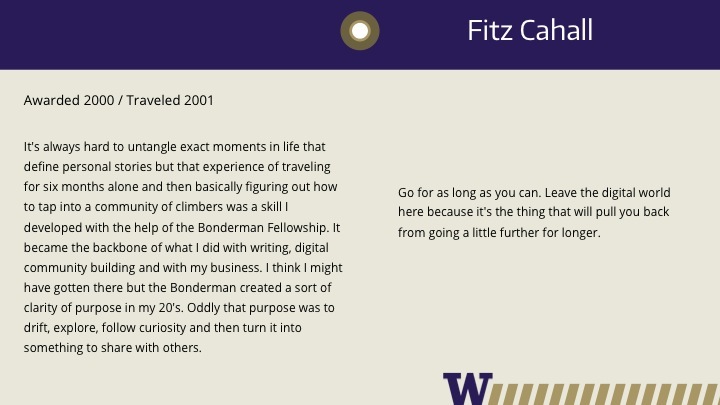 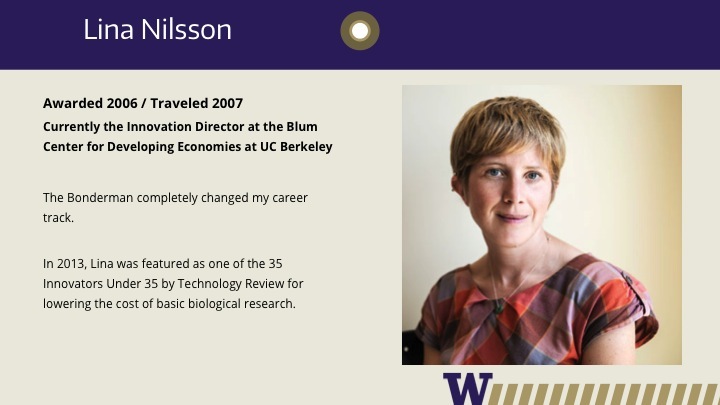 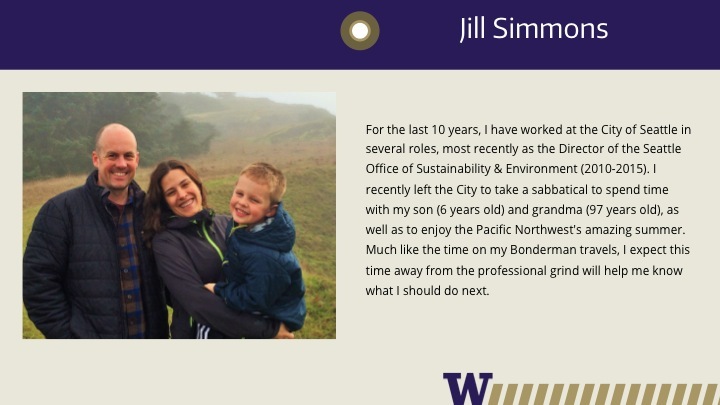 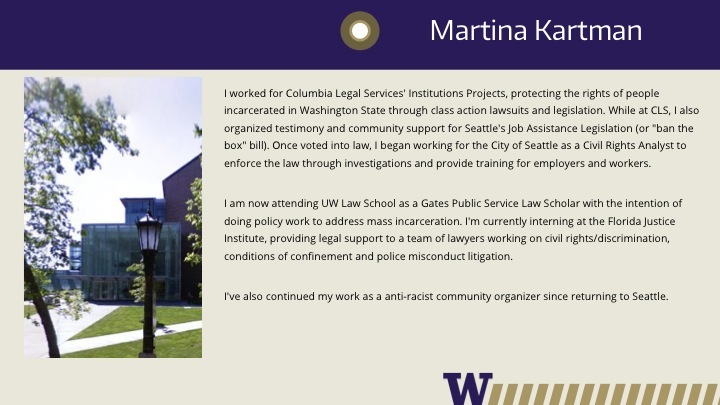 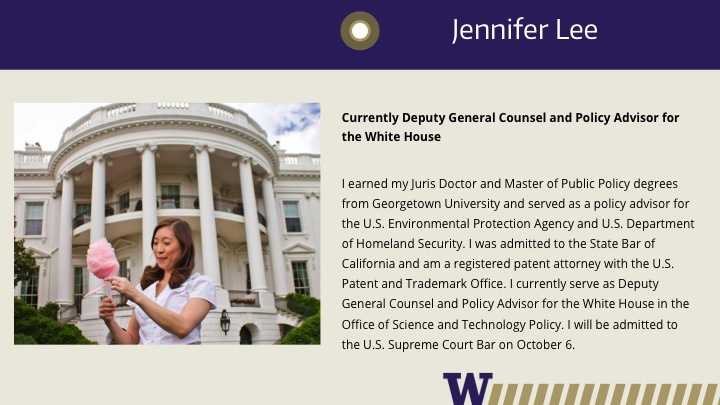 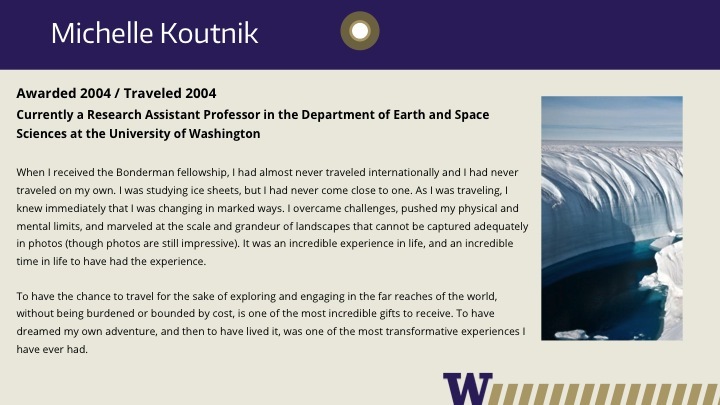 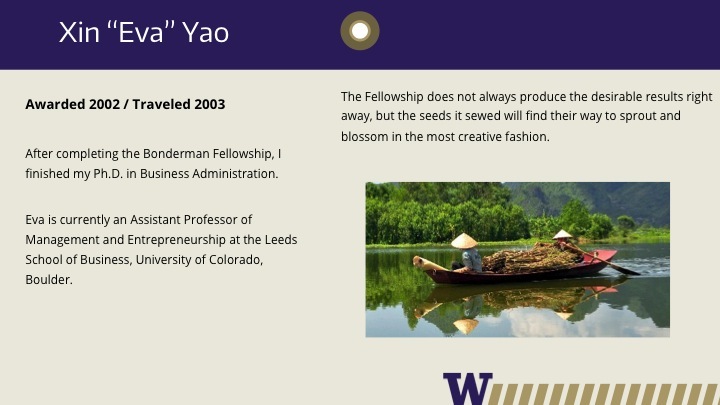 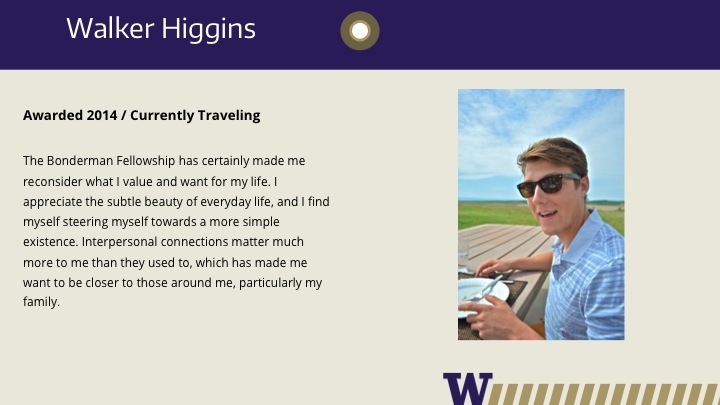 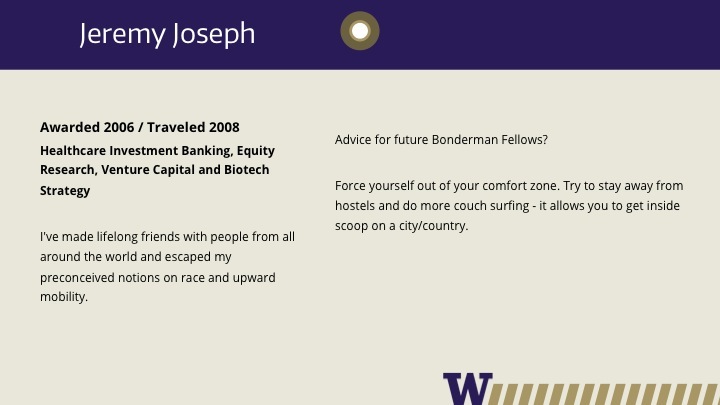 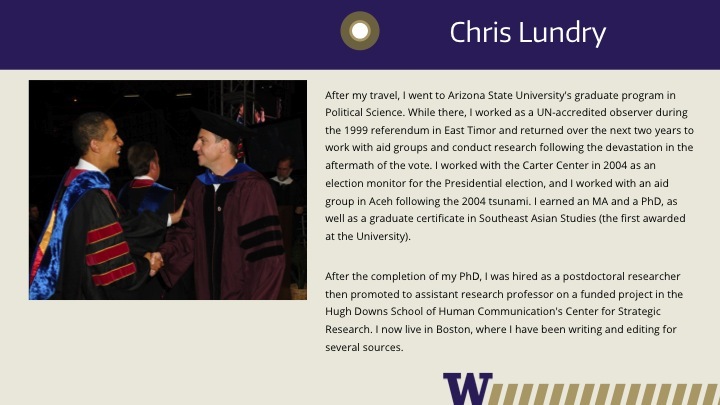 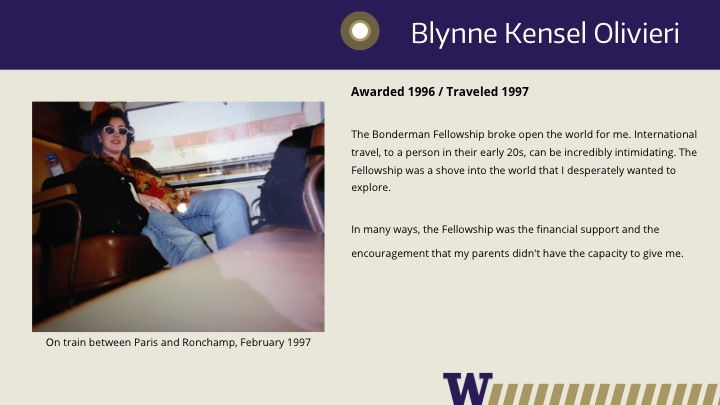 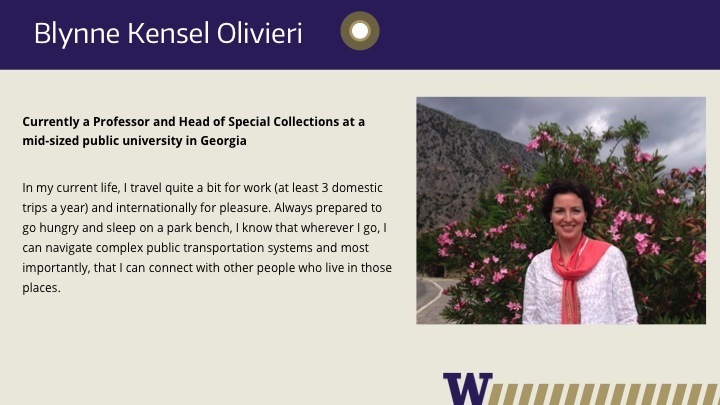 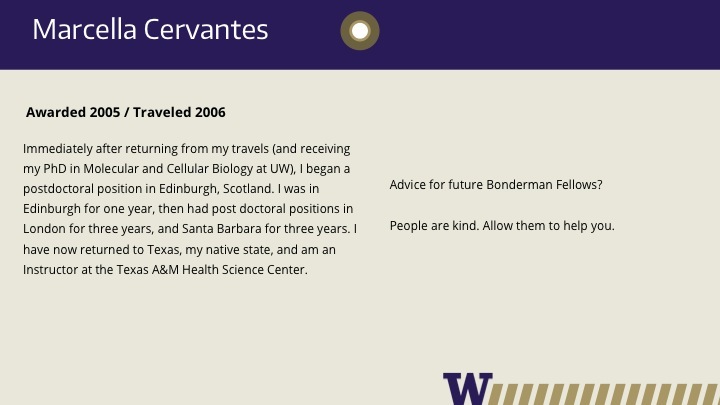 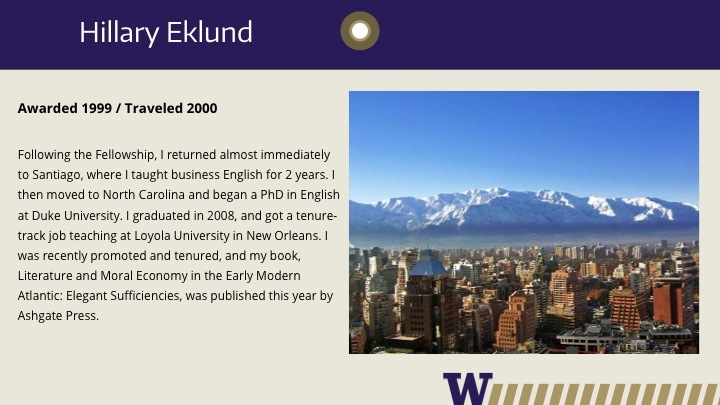 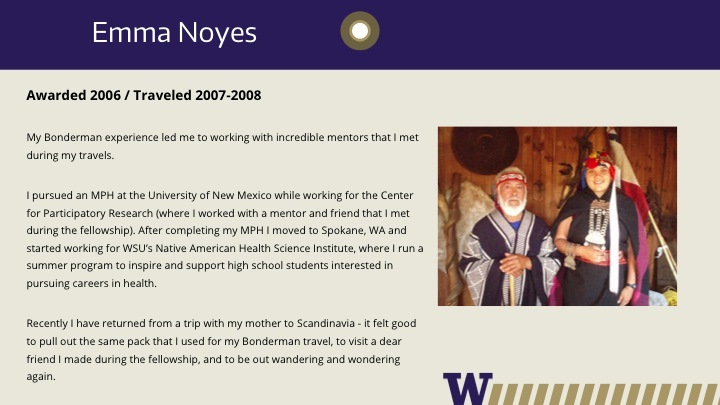 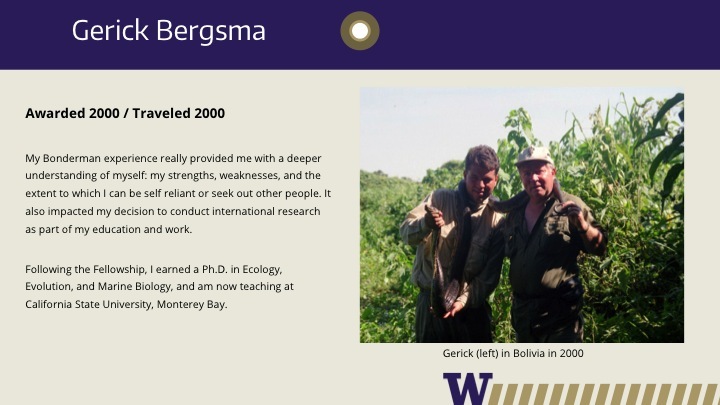 He went on to a varied career as a law professor and venture capitalist, and began UW’s Bonderman Fellowship at in 1995 with awards to undergraduates in the Honors Program and graduate students in Law and Business. 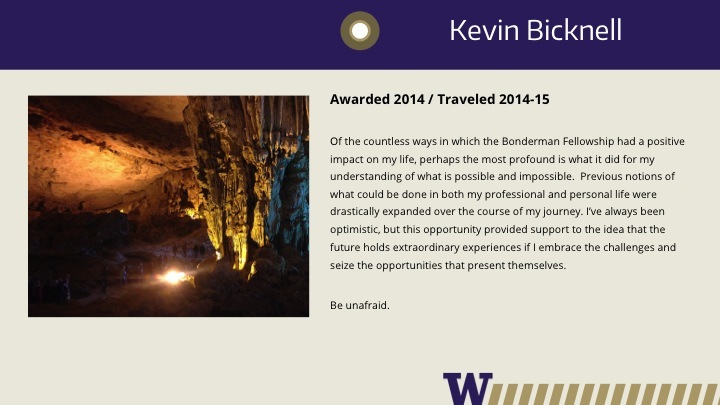 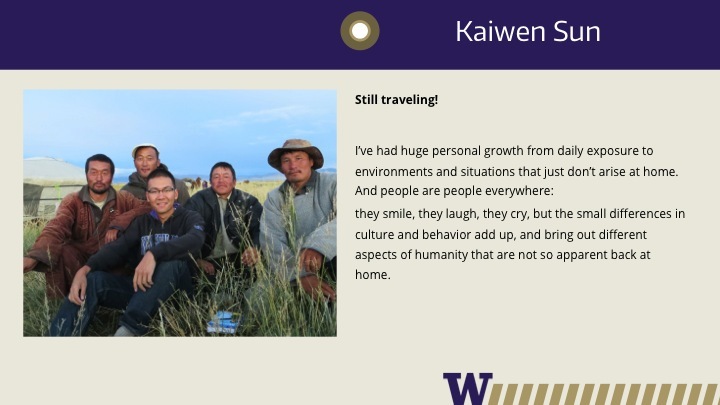 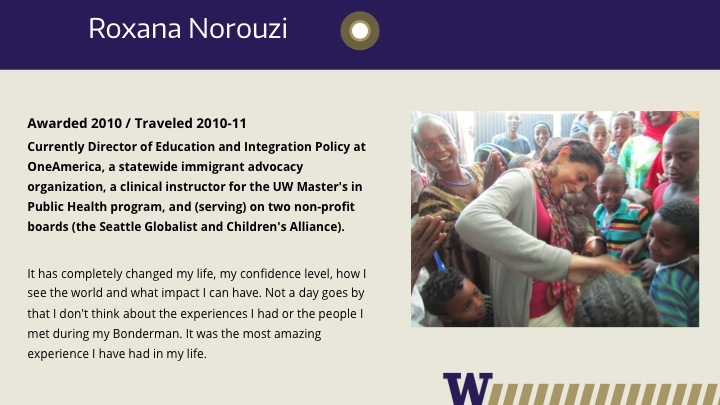 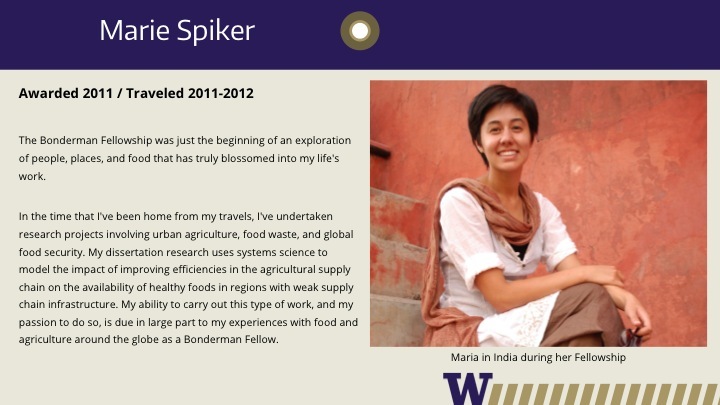 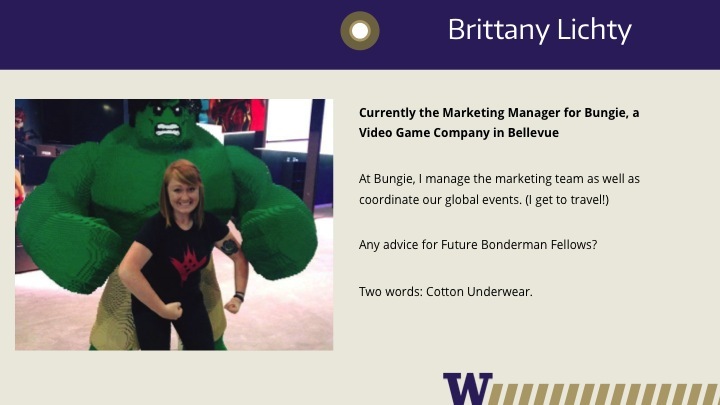 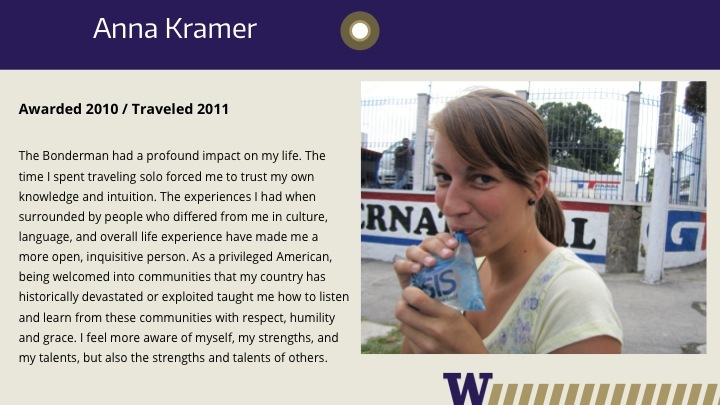 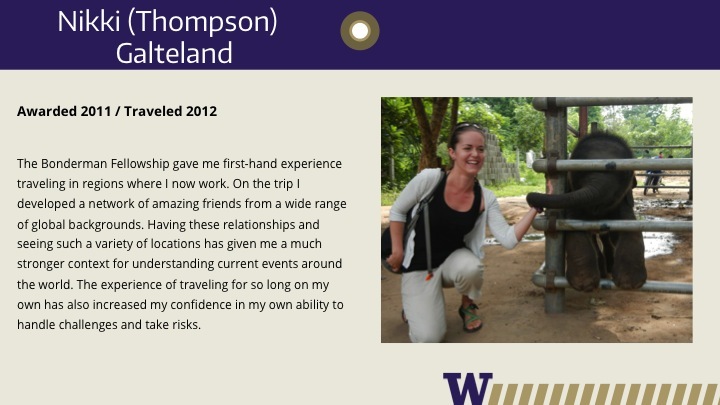 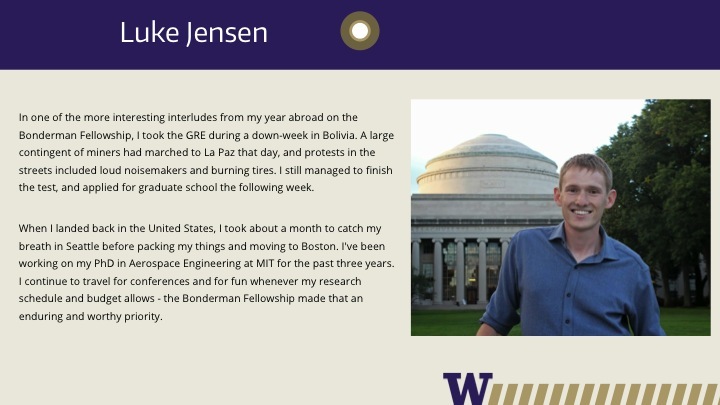 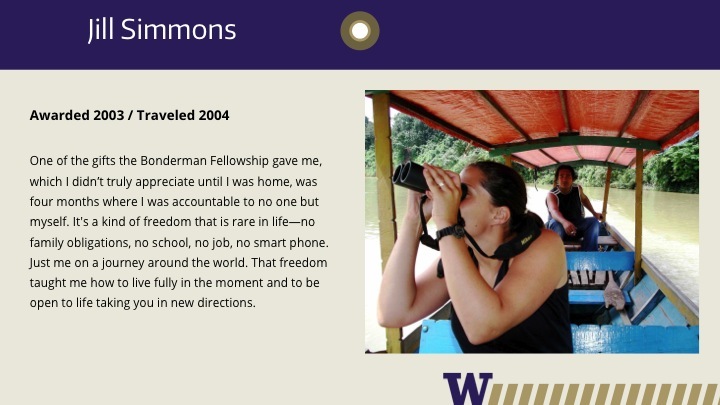 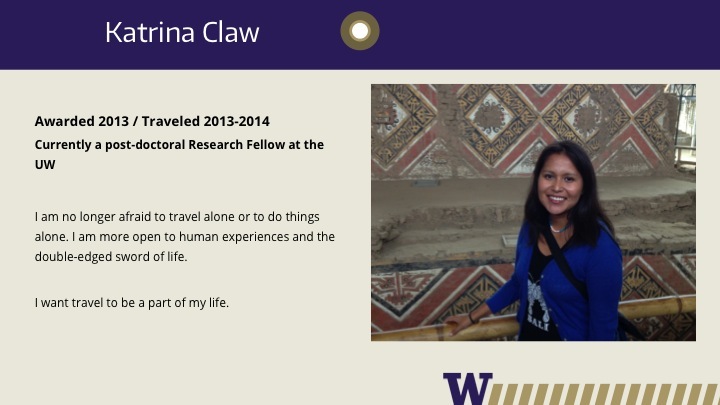 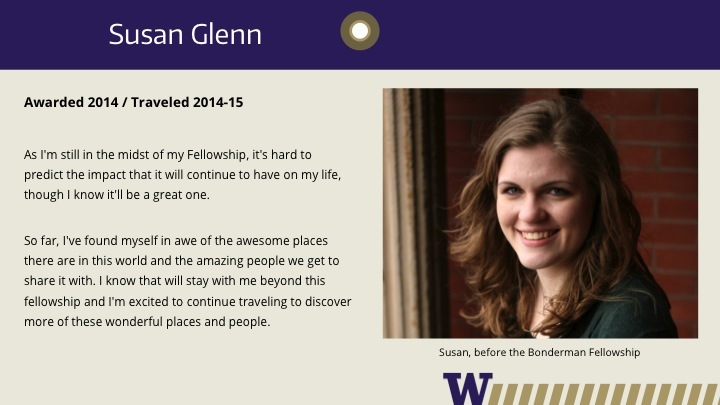 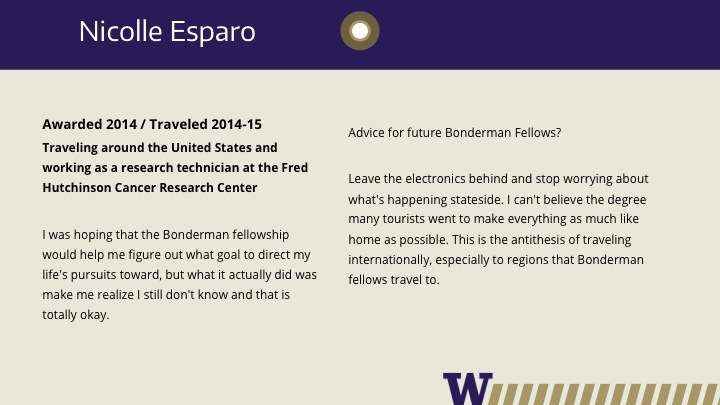 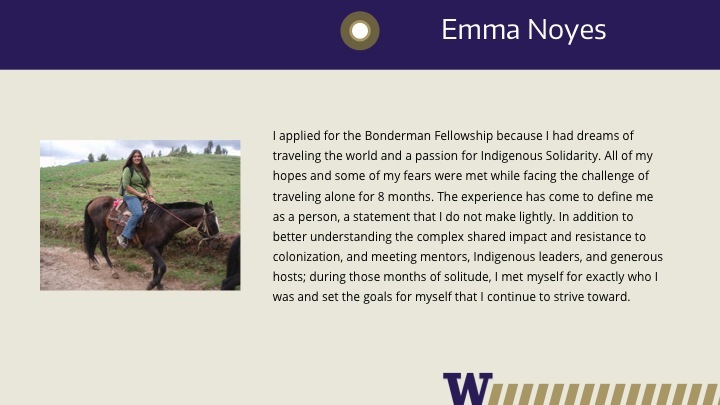 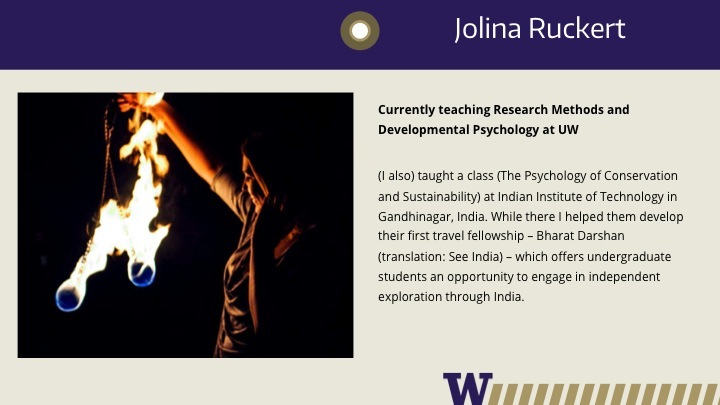 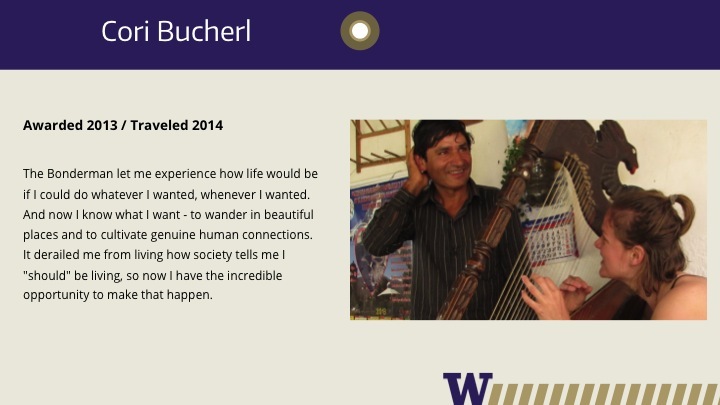 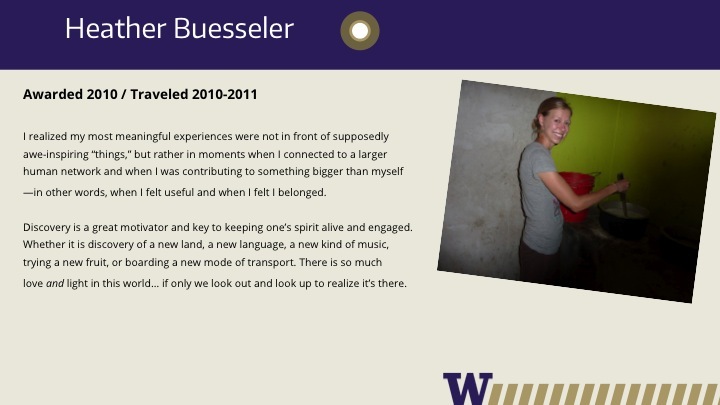 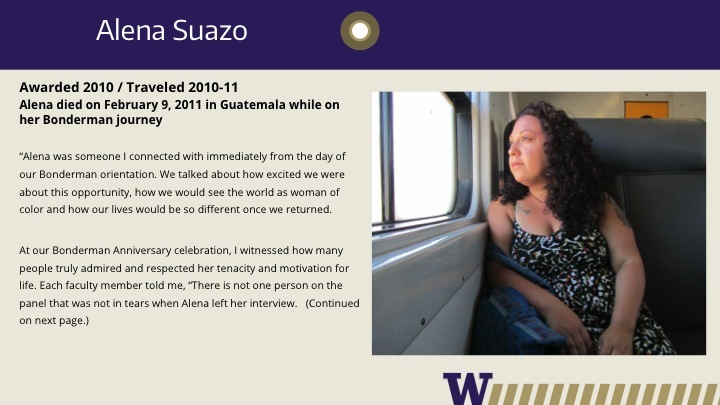 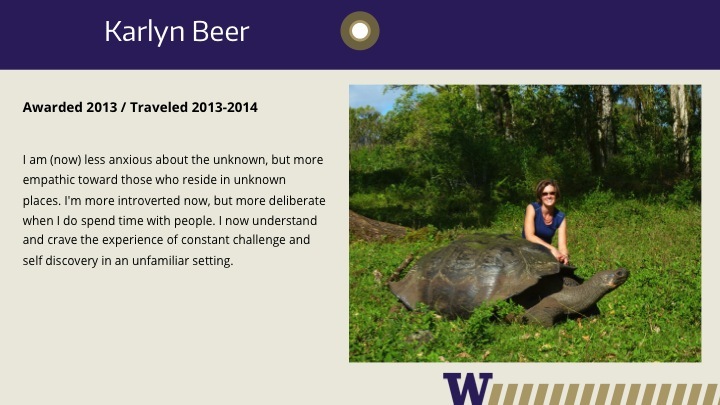 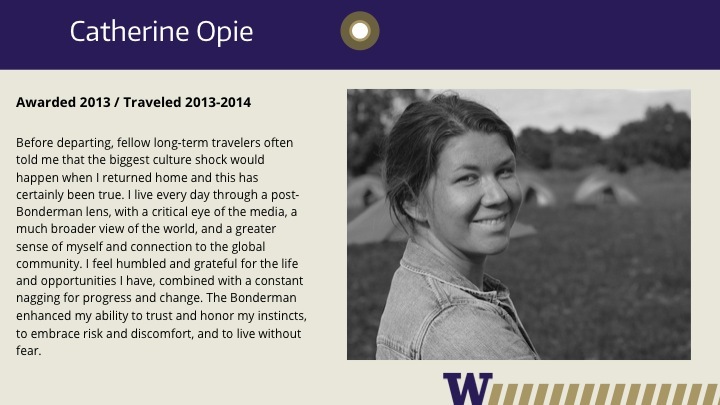 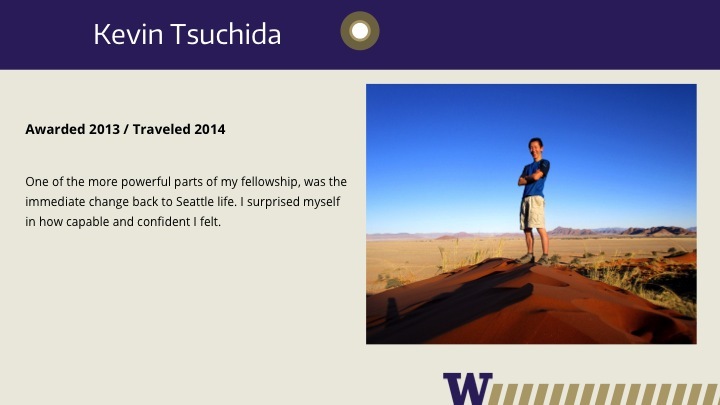 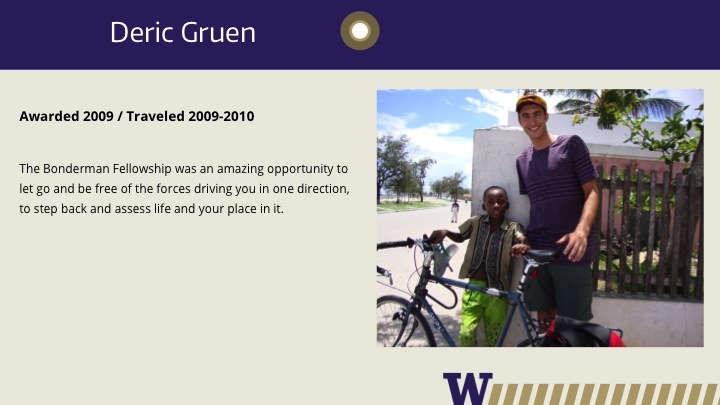 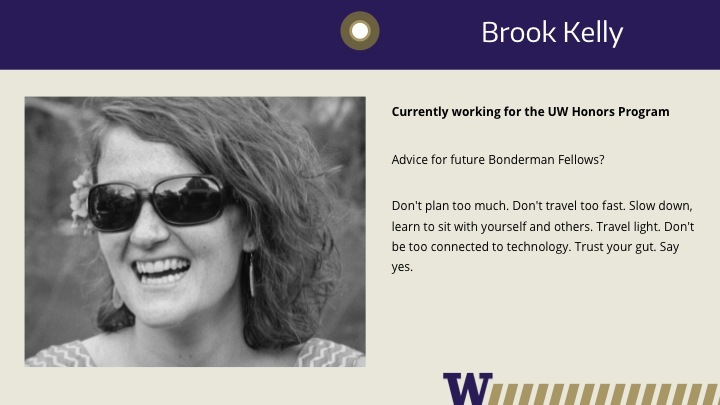 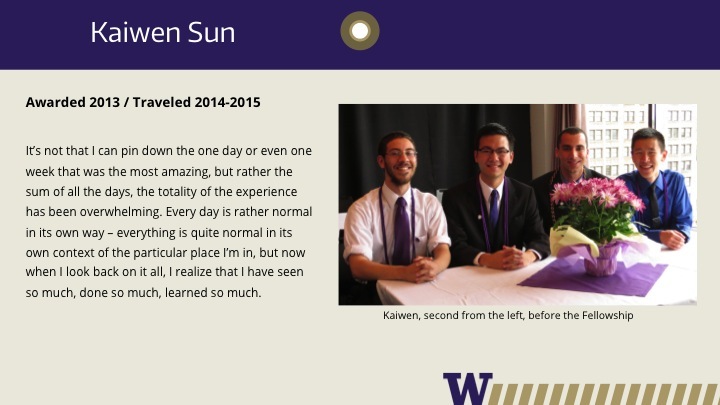 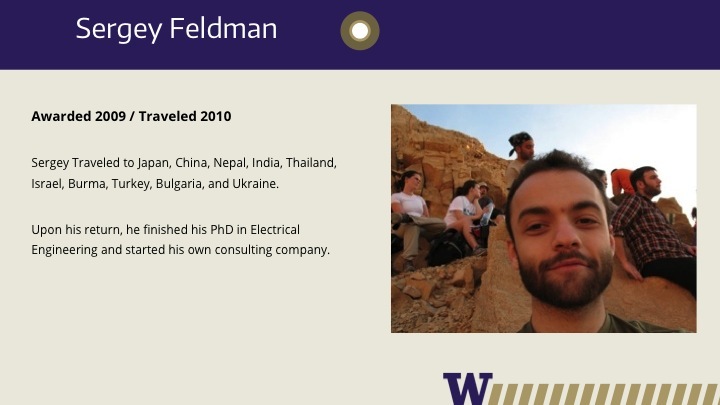 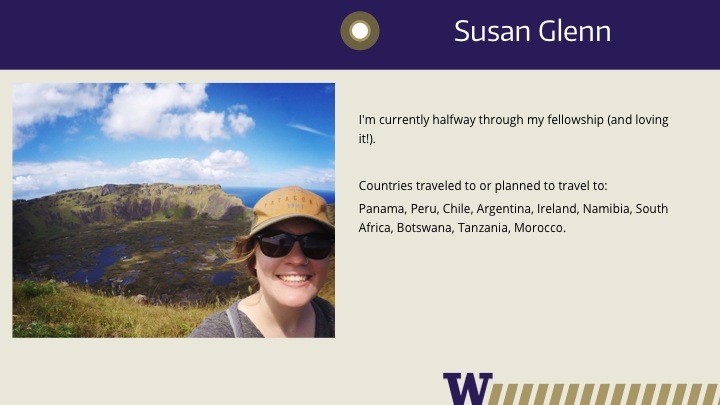 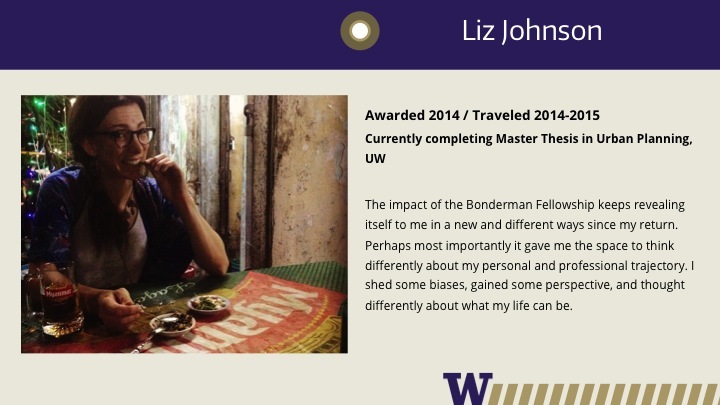 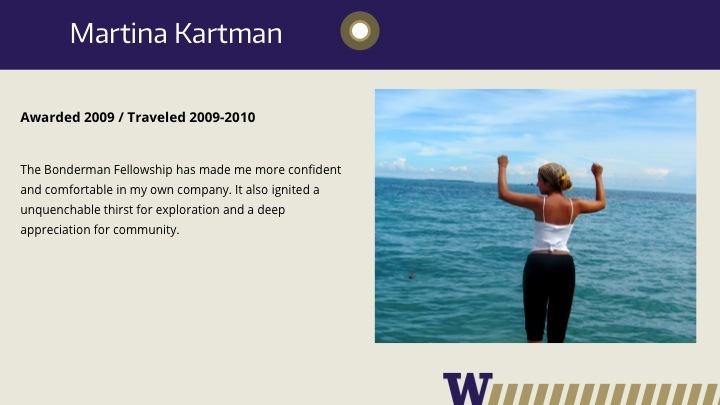 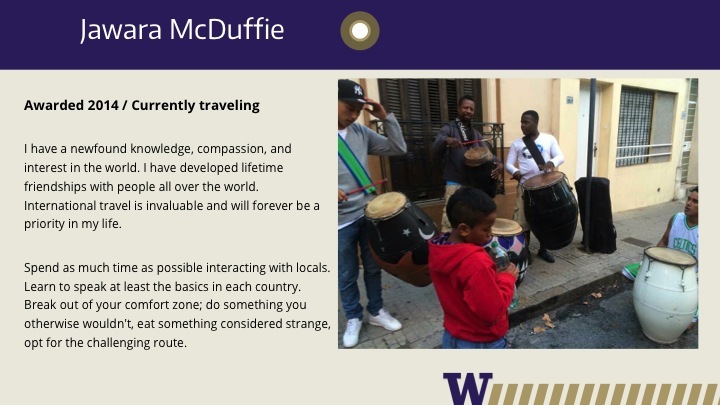 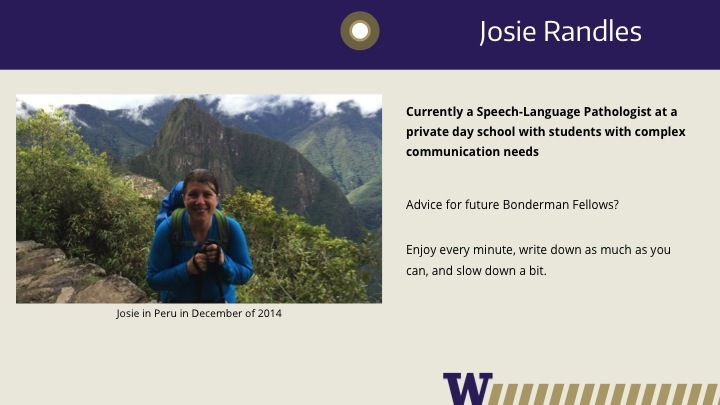 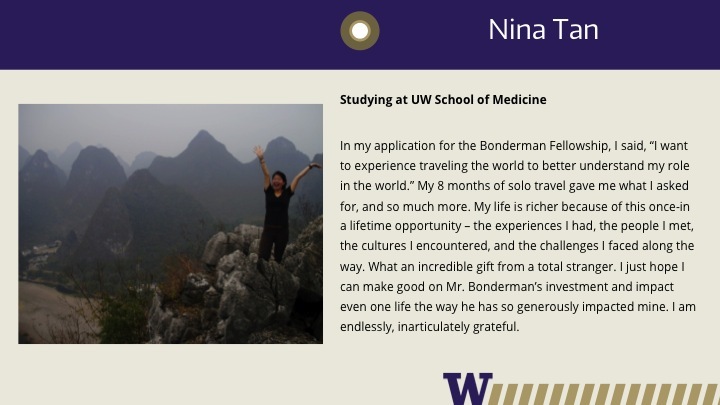 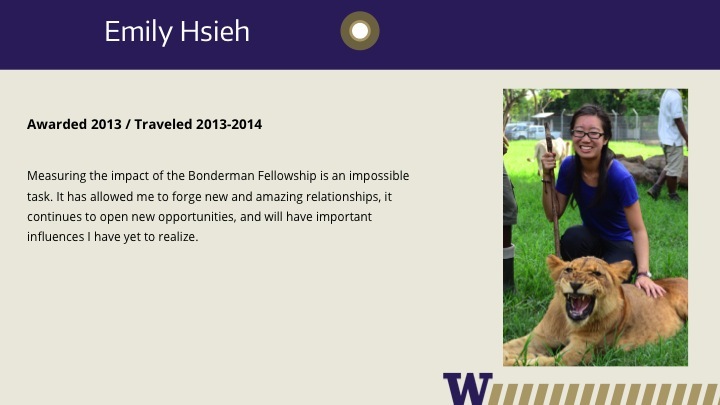 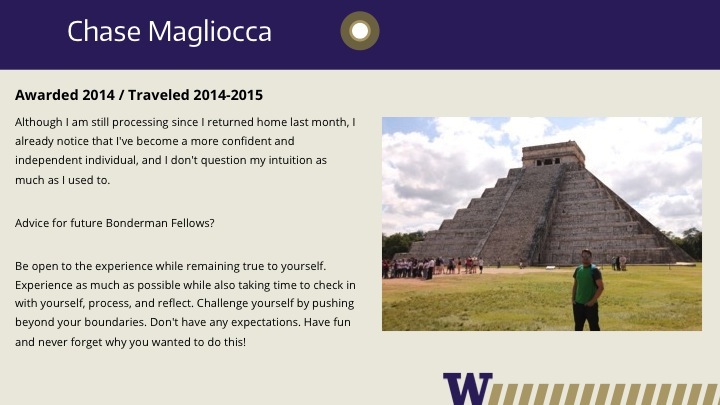 Now open to all UW graduate and professional students, as well as high-achieving undergraduates from all three UW campuses, the Bonderman Travel Fellowship has provided more than 200 students the opportunity to see the world in a new way. 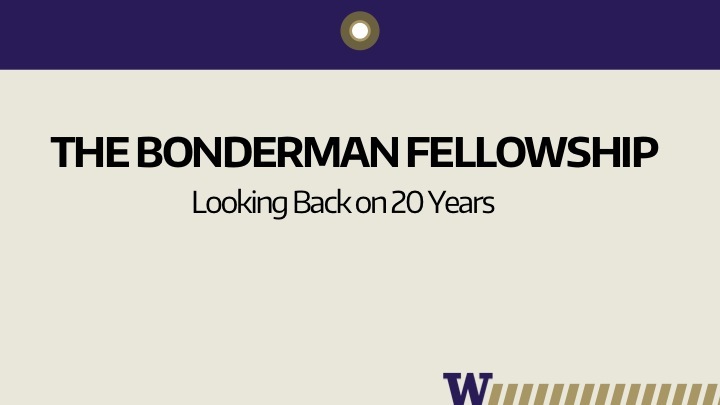 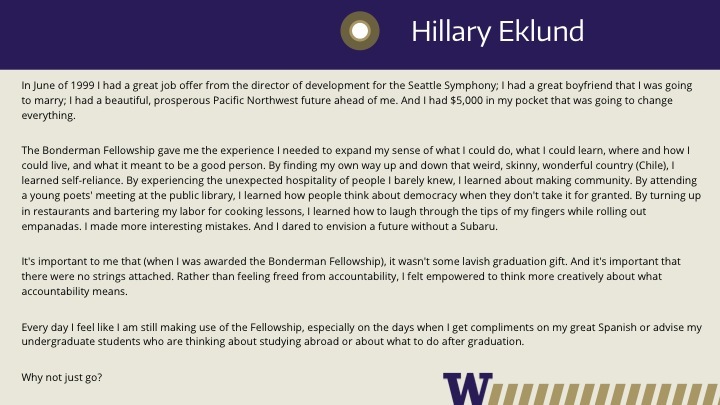 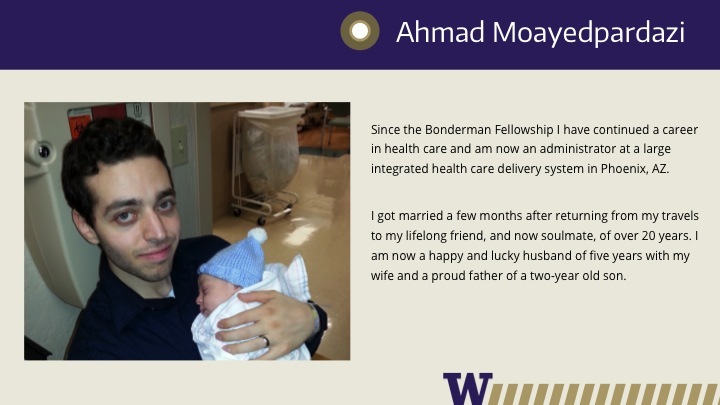 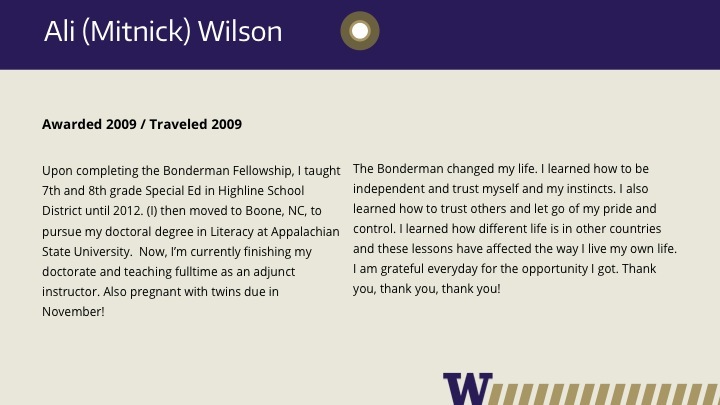 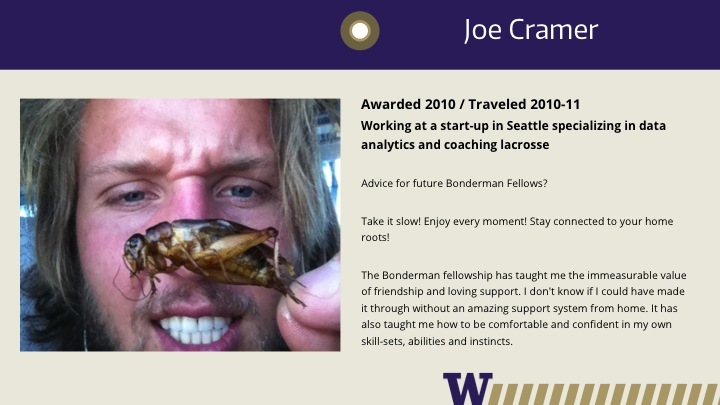 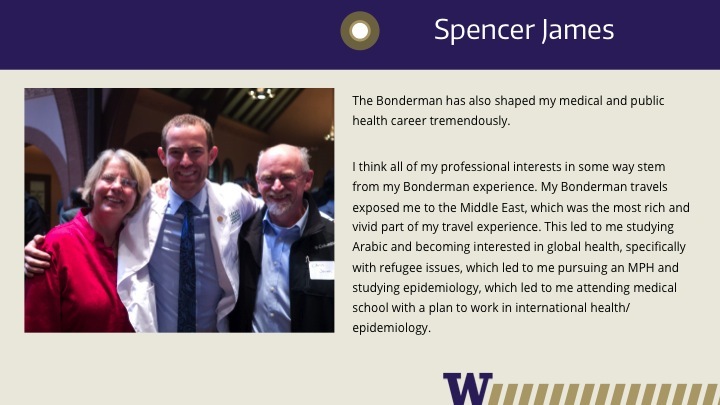 Bonderman indicated his intention to continue the Fellowship, so we can look forward to these experiences continuing, rippling out through hundreds of fellows to impact hundreds of thousands more. 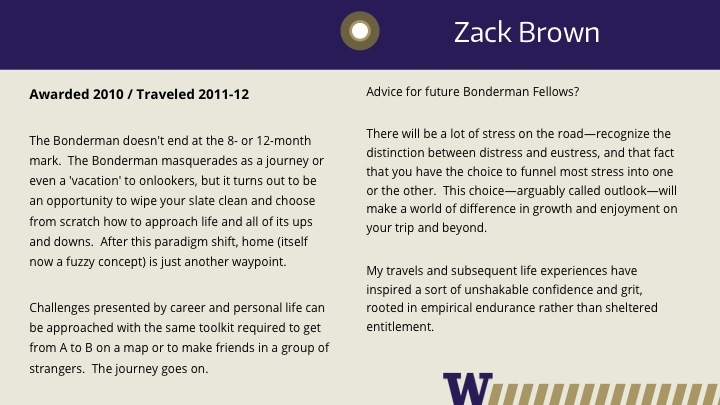 Fellows preparing for their journeys spoke excitedly about their plans with those who had gone before them. 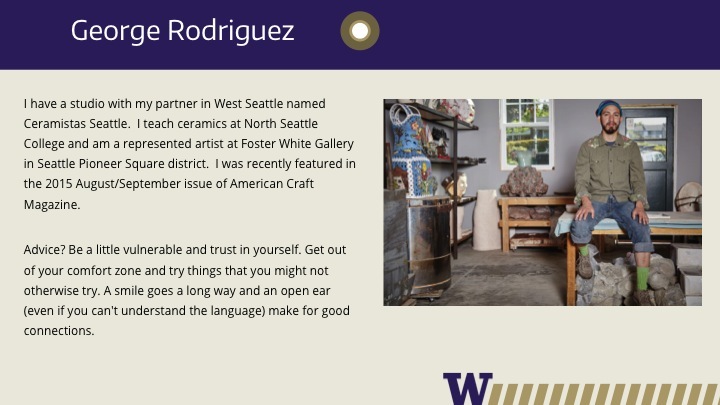 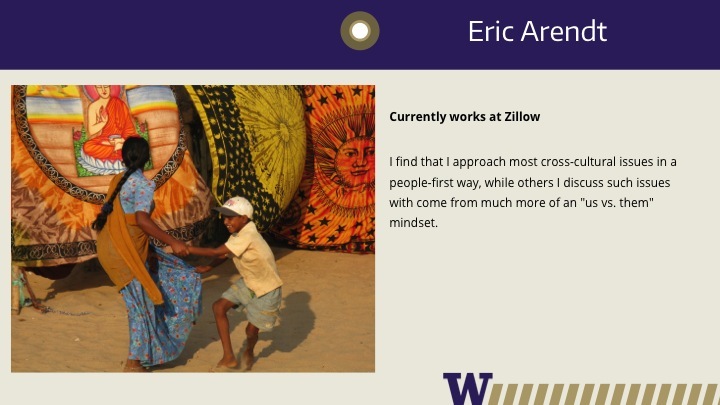 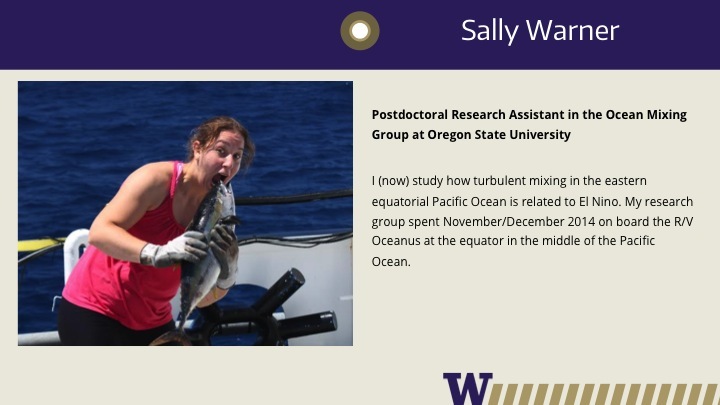 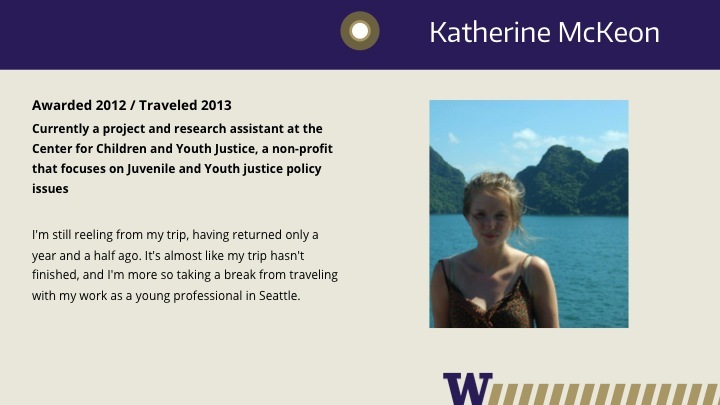 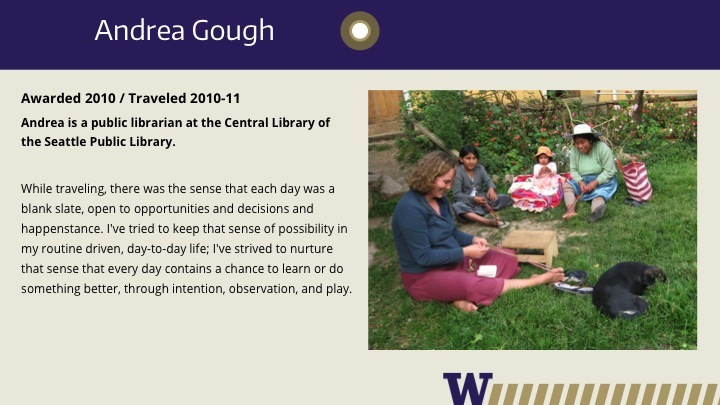 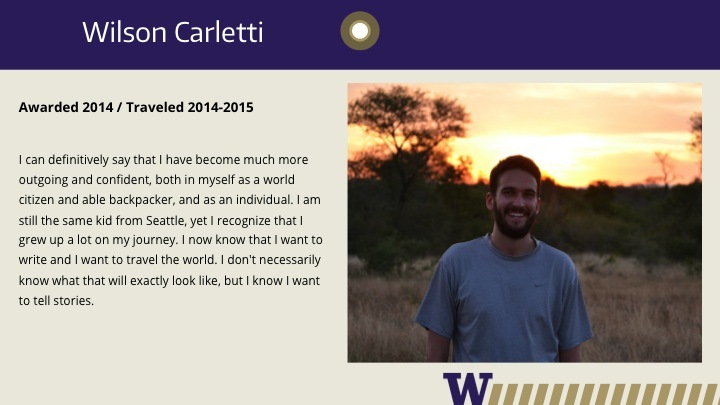 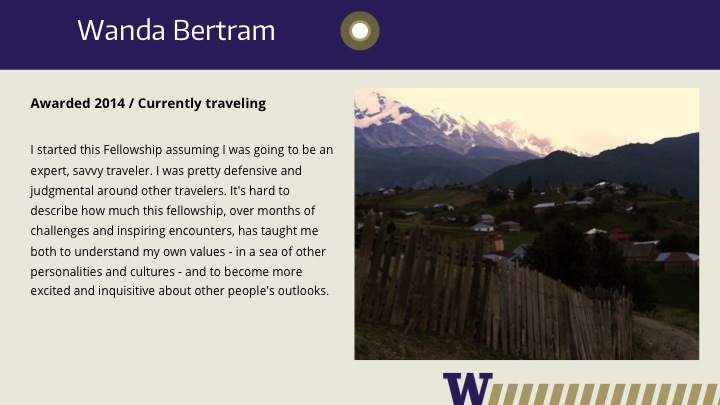 New Fellows Xoe Amer and Matt Bell, both Seattleites and recent graduates, have vastly different plans for where they will go and what they will do in their travels to Peru, Iceland, Brazil, Vietnam, Japan (to name a few). 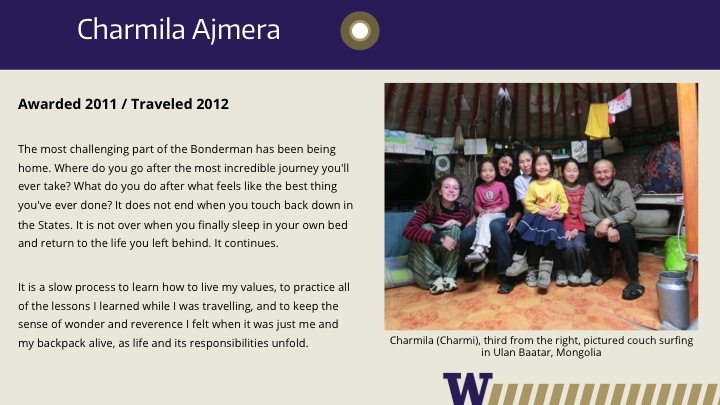 They are united in their willingness, however, to find out what is like to be genuinely boundless. 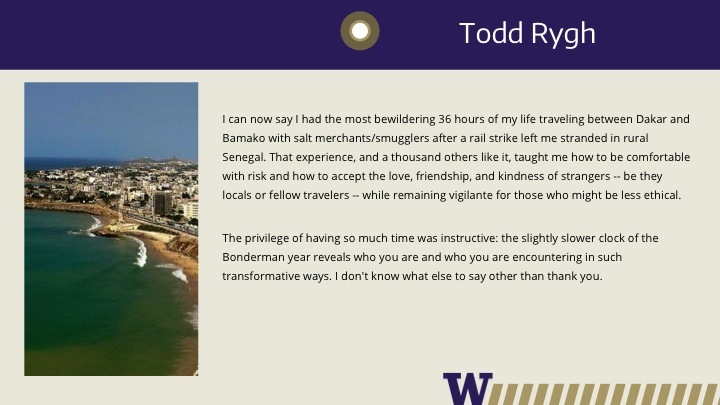 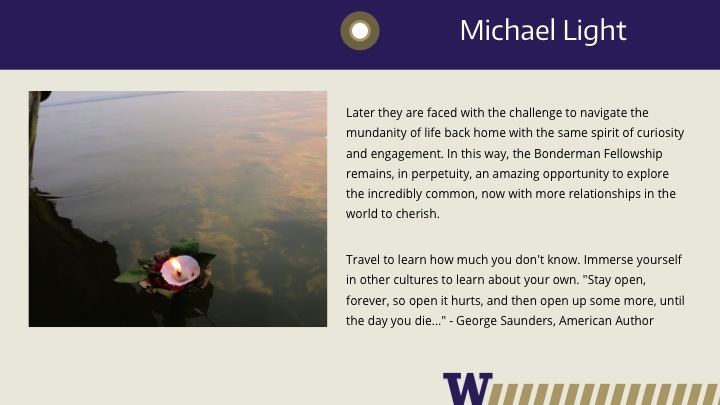 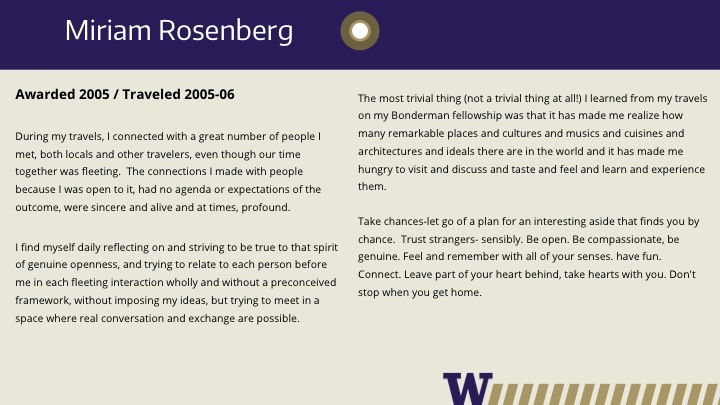 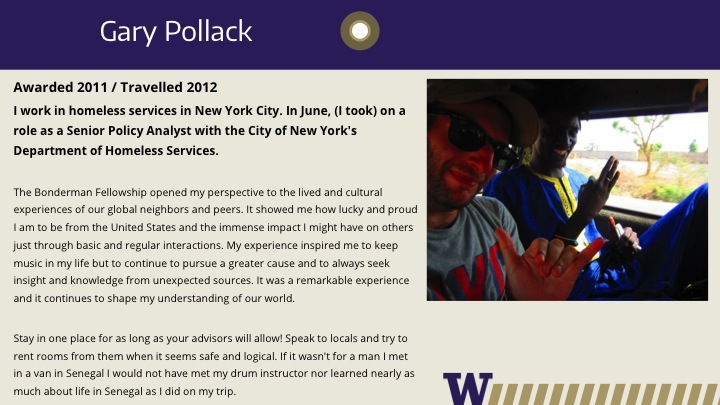 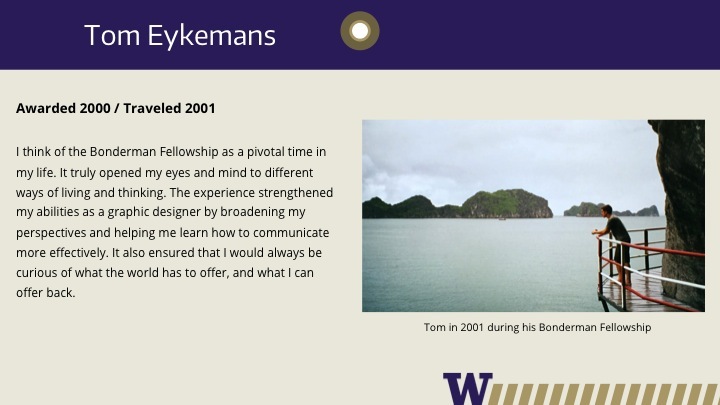 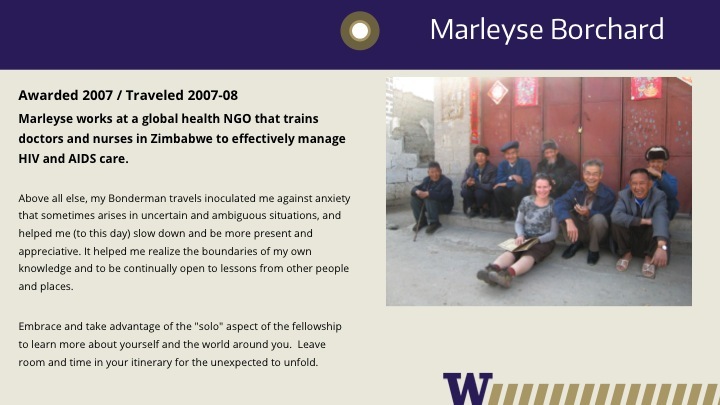 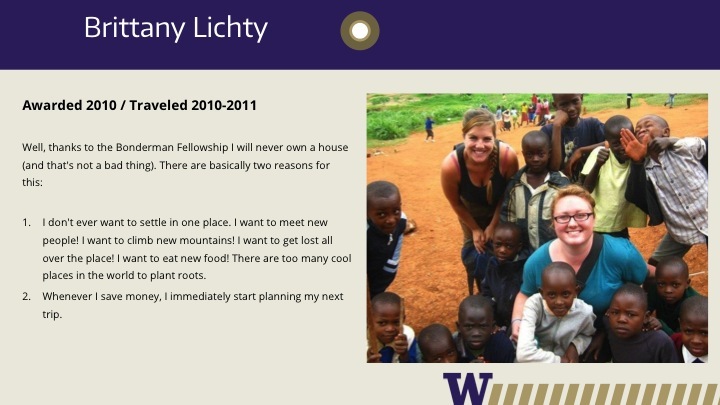 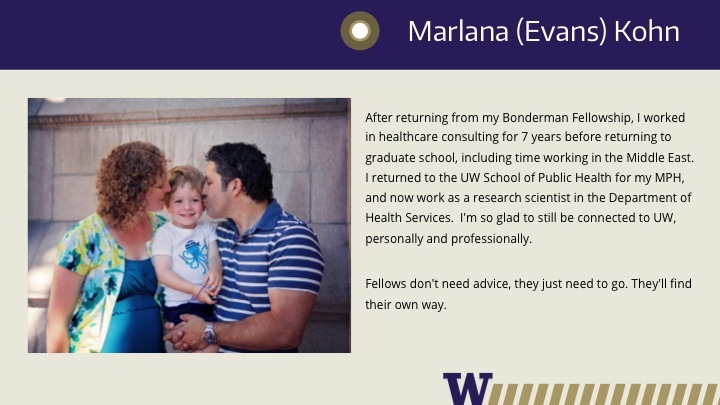 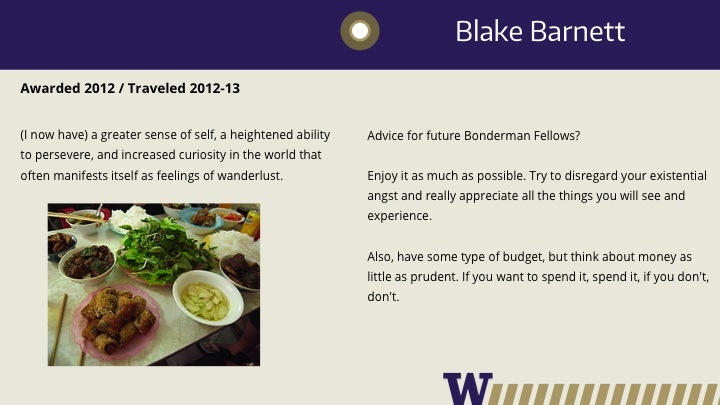 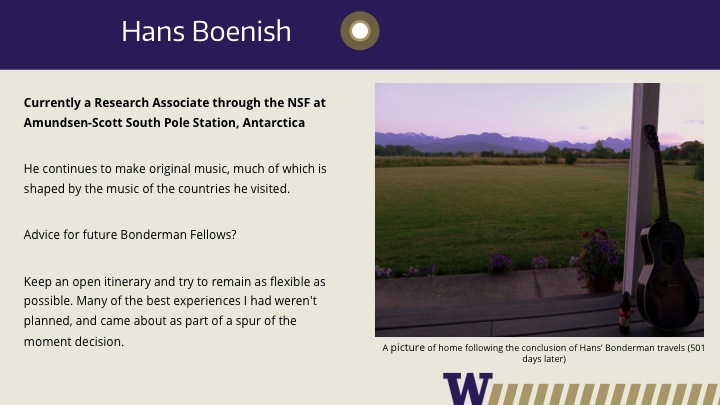 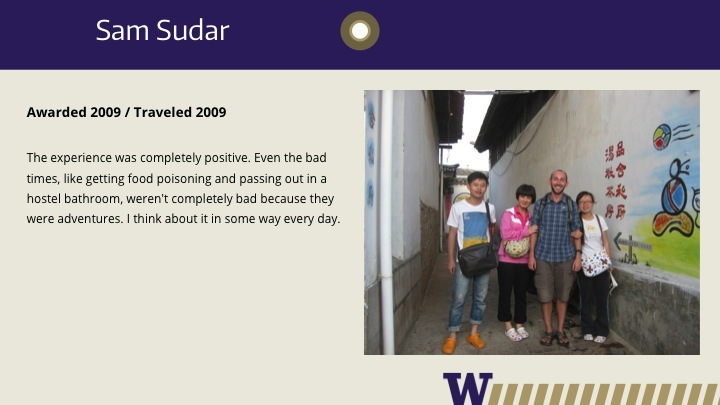 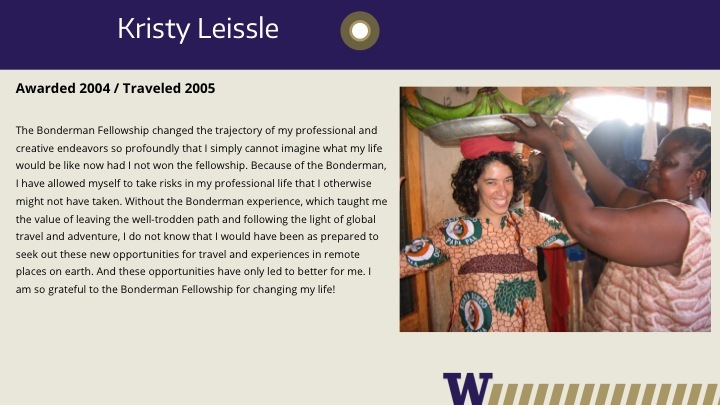 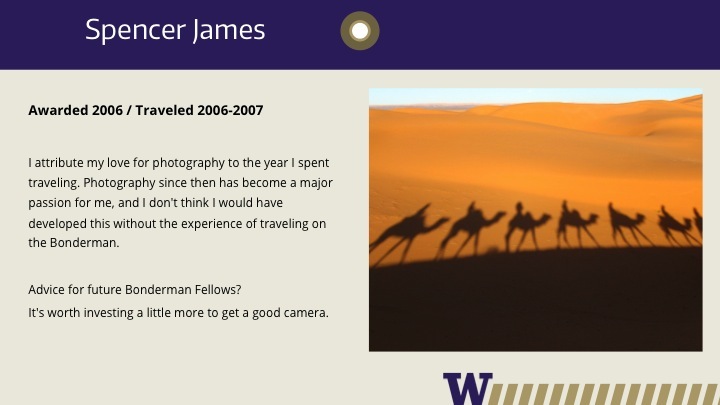 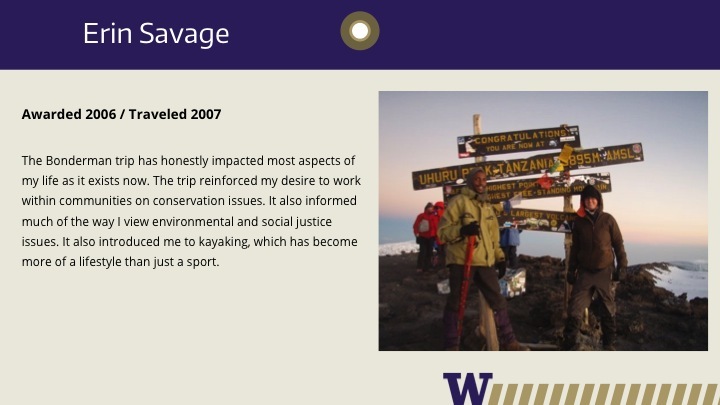 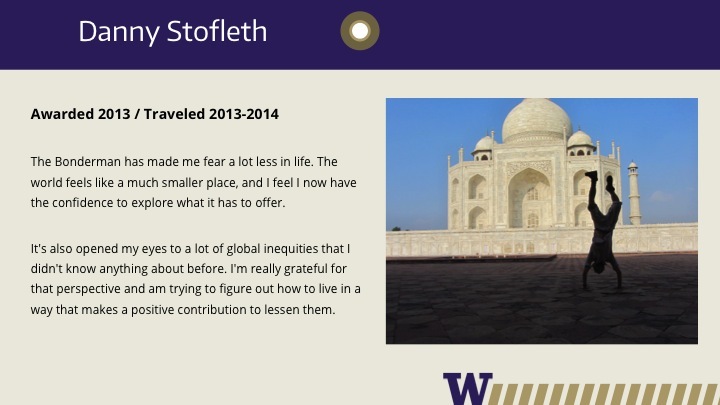 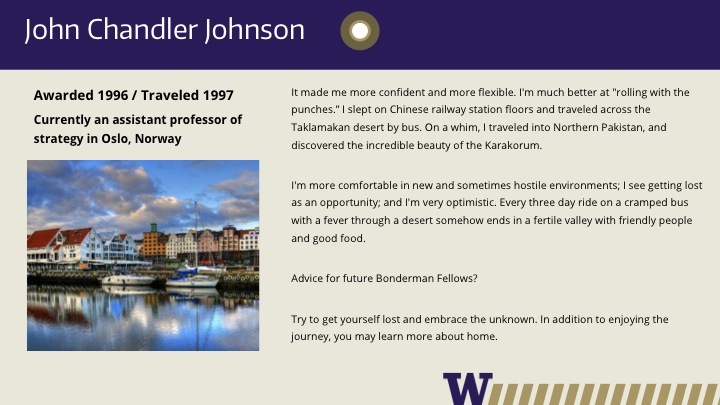 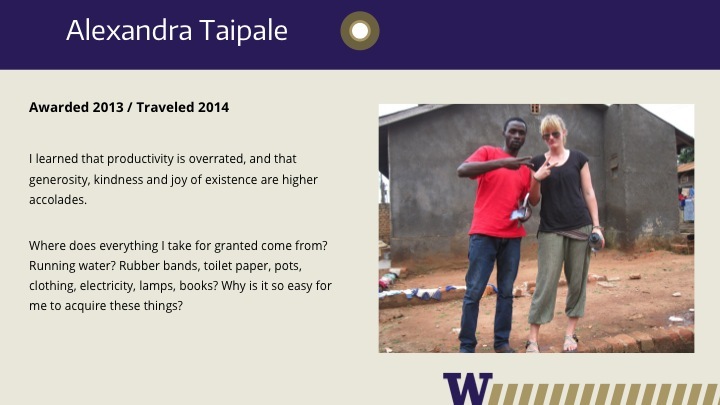 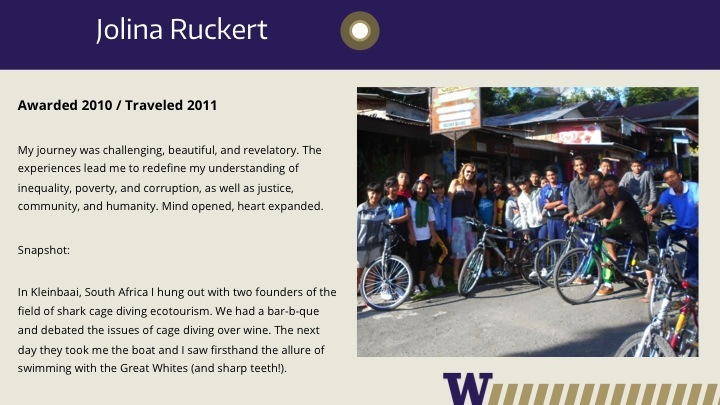 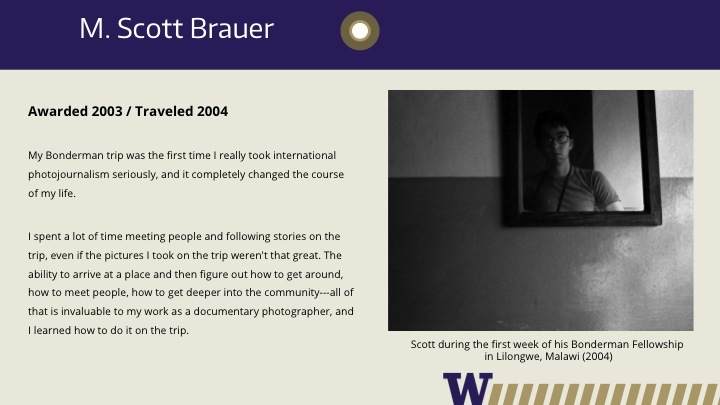 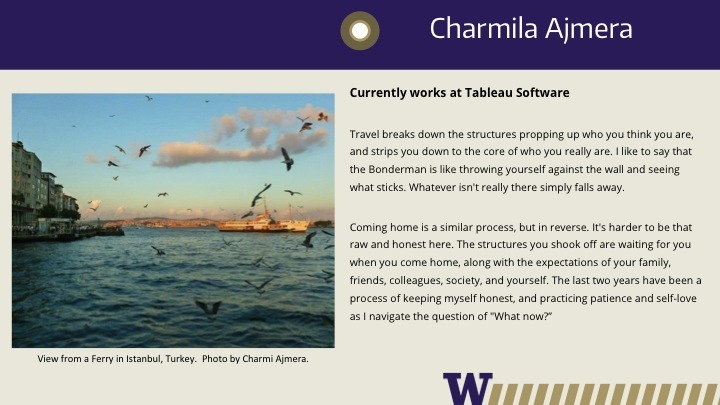 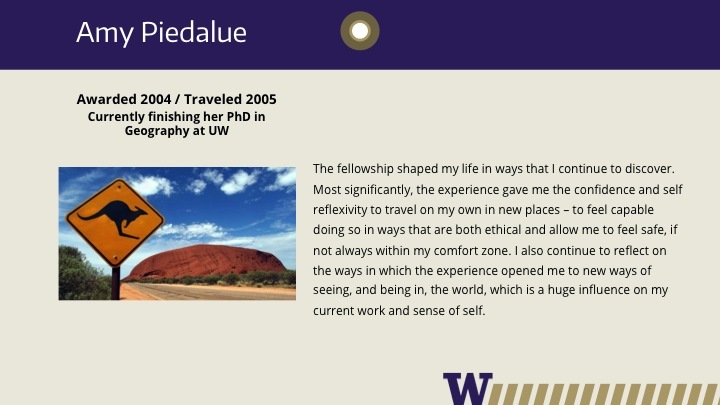 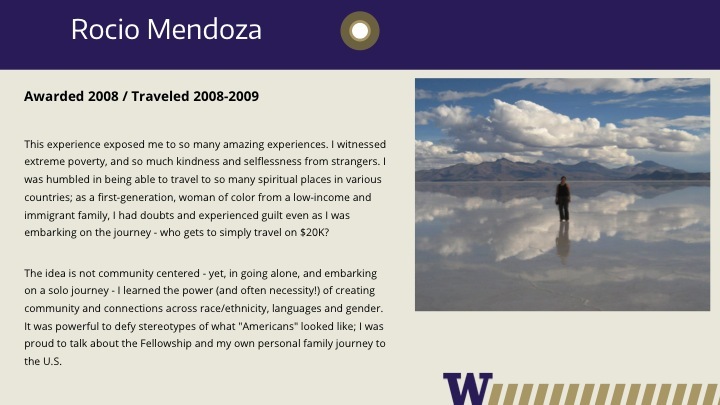 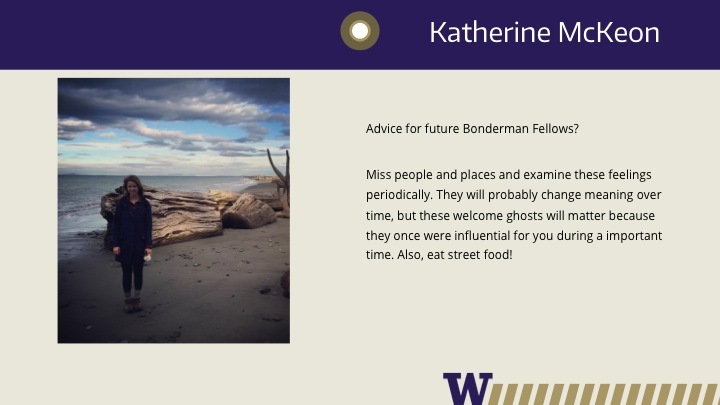 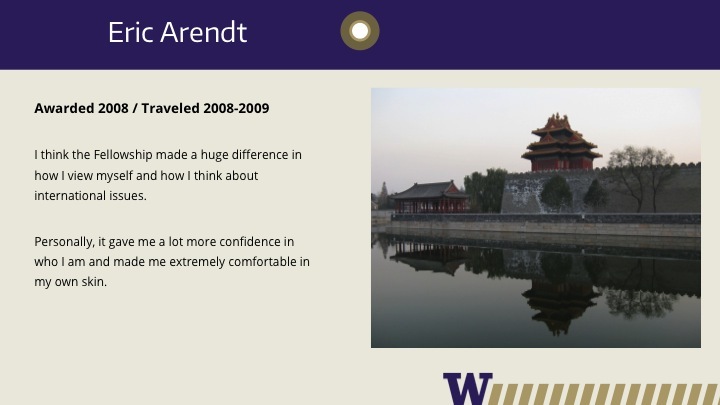 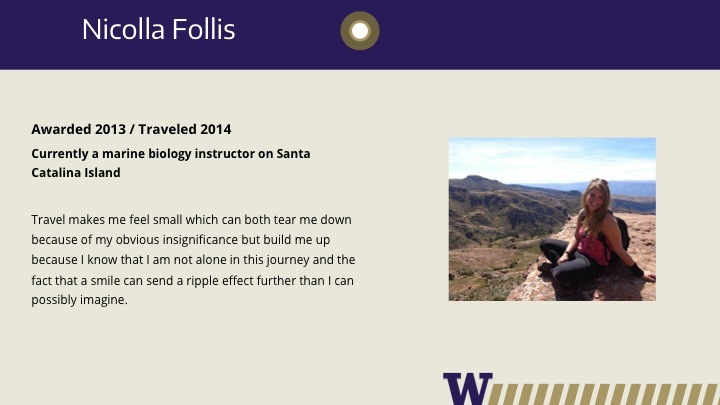 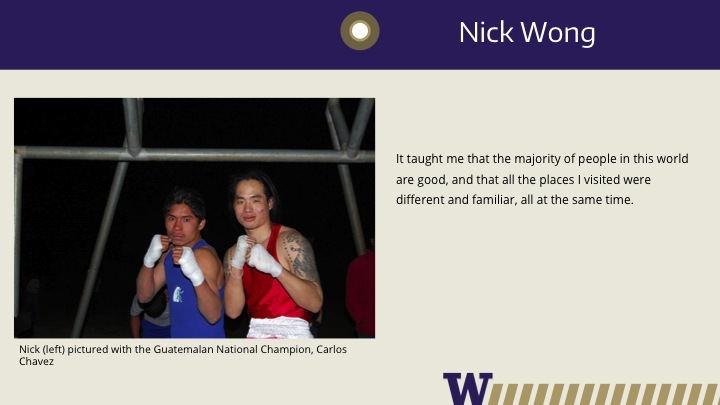 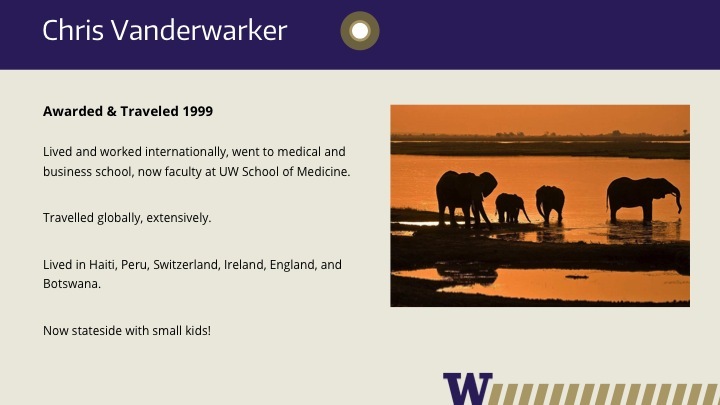 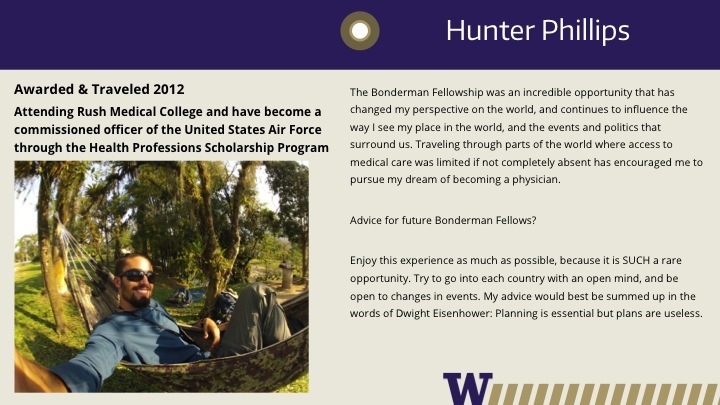 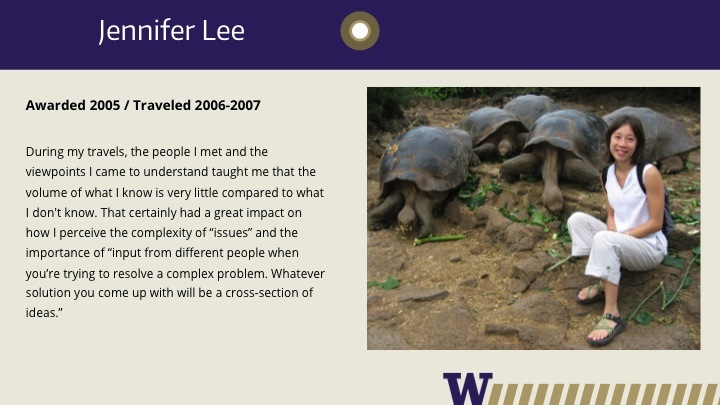 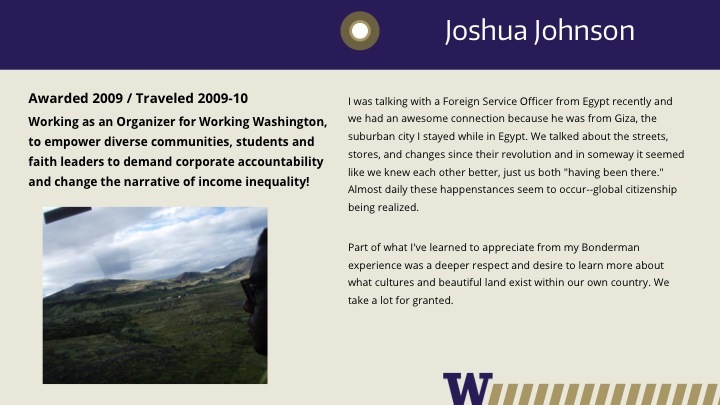 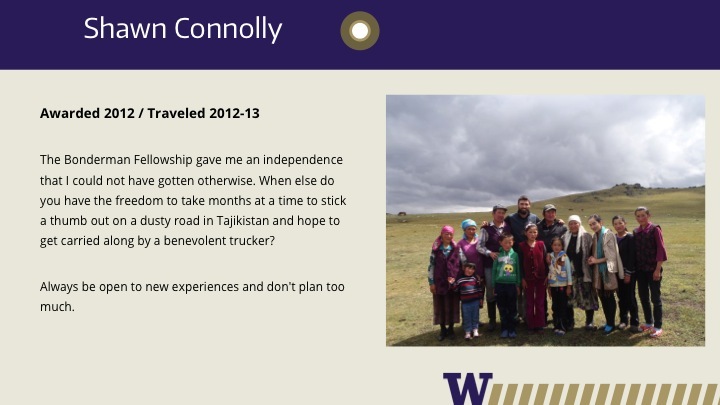 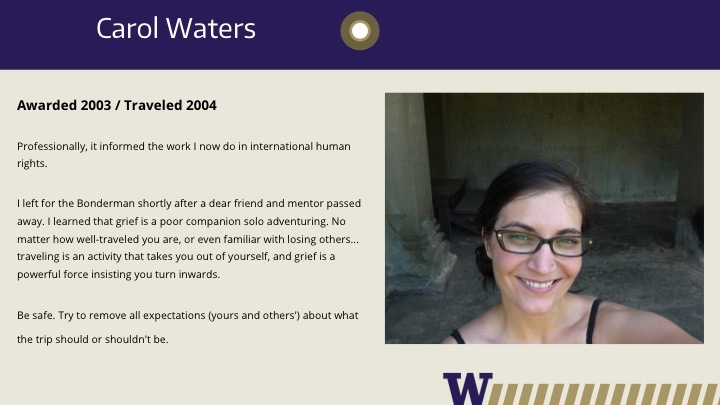 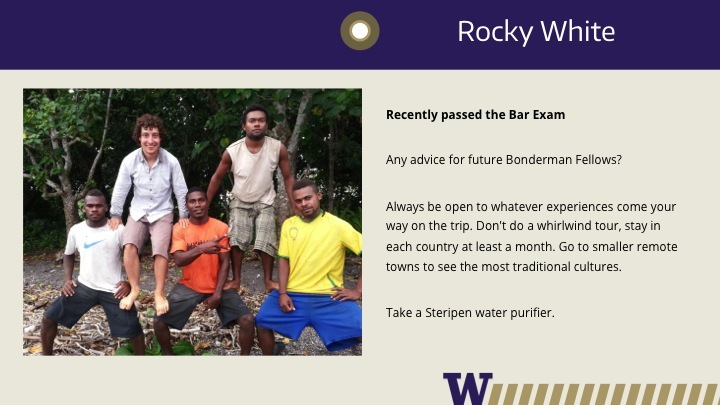 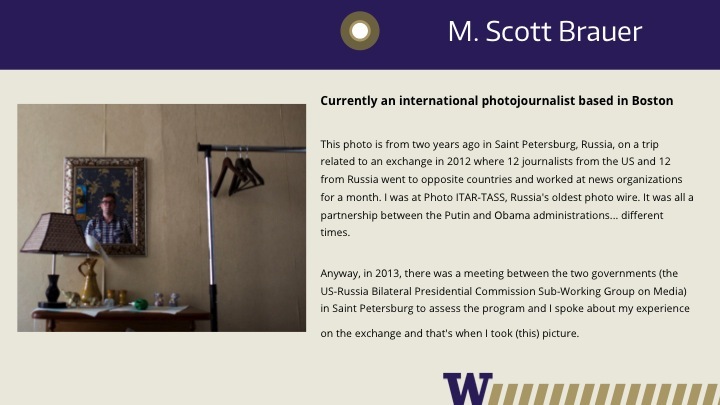 In this slideshow, created in 2010 to commemorate the 15th anniversary of the Bonderman Travel Fellowship, Bonderman Fellows share their worldwide travels via their own words and photos. 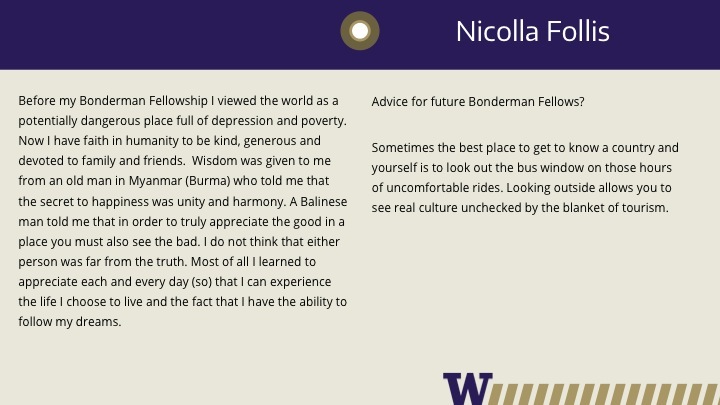 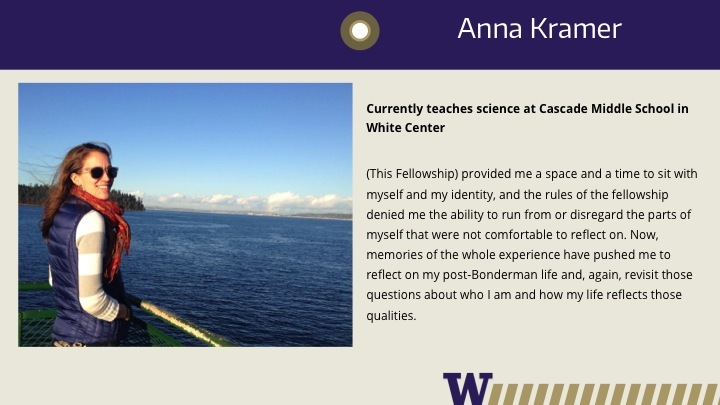 Featuring Marleyse Borchard, Gerick Bergsma, Adamn Grupp, Brianna Craft, Rocio Mendoza, and Spencer James, it illustrates the vast diversity of the Fellows’ experiences and how it continues to impact their lives.